Navajo Mountain seen from the Bryce Canyon National Park. This article is sort of a continuation of issues related to light scattering in the Earth’s atmosphere as well as haze presence. These subjects are closely assciated with each other, so some stuff presented here can be pretty much similar and it will be developed on the grounds of my previous articles. This 2-partial article leads to explain when is the best time to attend to long-distance observations and what elements contribute to this kind of tourism and photography. – Vertical visibility, that determines how far can we see up or down. In practice this feature is varied due to meteorological conditions (like planetary boundary layer) described in previous article. The vertical visibility is also a distance, that an observer can see vertically into a surface-based obscuring phenomenon, such as fog, rain and snow (McGraw-Hill Dictionary, 2003). 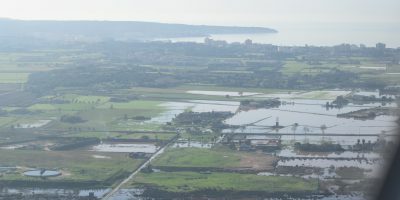 In the aviation the vertical visibility is the maximum height from which a pilot can recognize ground features when the surface is obscured because of a meteorological phenomenon. – Horizontal visibility, which is usually more important, because it affects our ability to view the distant landscape features. Those distant landscape features are a prominent objects, that can be identified with naked eye, typically referred to the atmospheric or meteorological visual range (Malm, 2016). Visibility can be treated as an environmental quality that is valued for aesthetic reasons that are difficult to express or quantify (Hyslop, 2009). Everywhere we have locations, that can boast a scenic landscape closer or further. Unfortunately air pollution and another big haze concentration can degrade closer scenic vistas and obscure those, located further from the observer. 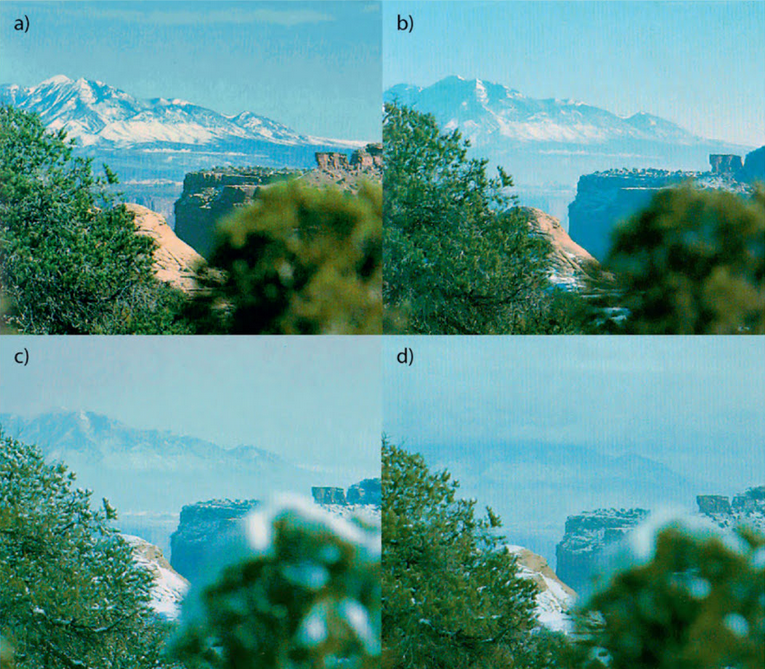 Particular matter affects visibility in multiple ways: obscure distant objects, drains the contrast from a scene and discolors the sky (Hyslop, 2009). In previous decades the visibility was almost exclusively used to denote the human capability to detect, recognize and identify objects. Since the industrial revolution, when many pollutants has been emitted into the atmosphere visibility emerged as an aesthetic concern especially within protect areas. In this article I would like to enclose the factors, which influence on the horizontal visibility range, highly important for long-distance observation purposes. The most obvious astronomical factor is diurnal position of the Sun, our another main source of illumination at night. 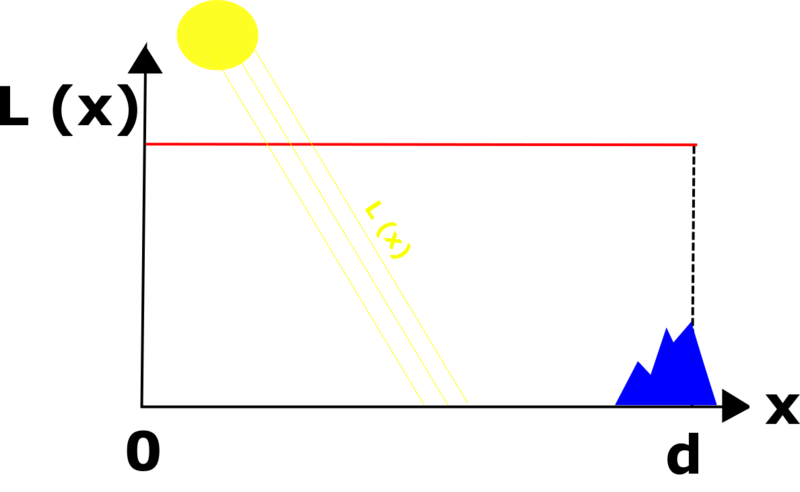 The position of the Sun will determine our angle between the source of illumination and the object observed. In my previous article about the haze I have developed this topic. When our object is to be found in more or less the same direction like Sun, then can be hardly recognised due to whitish haze appearance caused by forward scattering. Furthermore the angle at which the Sun illuminates a vista or landscape feature (Sun angle) plays another important role. First at higher Sun angles there is less scattering of light by the intervening atmosphere in the direction of observer. Second the vista reflects more light; consequently more image-forming information (reflected photons from the vista) reaches the eye. The contrast detail and scene are enhanced (Malm, 2016). The distant objects watched on the same part of the sky when Sun is located are more or less shaded by themselves, hence provides less details. Is far better to see the objects on the opposite side of the Sun, that are much better iluminated. 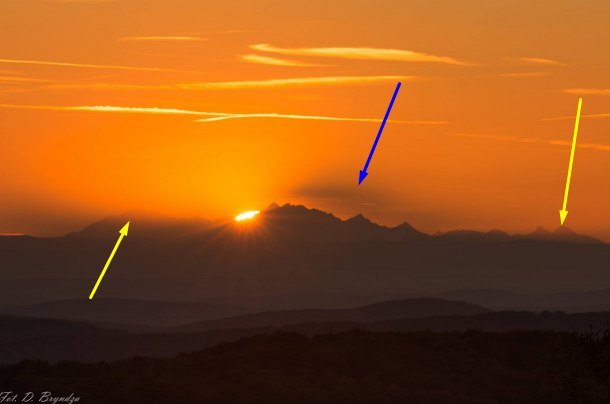 Conversely is in case of twilight, when objects being on the similar azimuth to Sun plunged in horizon are better visible due to light scattering properties (see below) (Pic. 1). Pic. 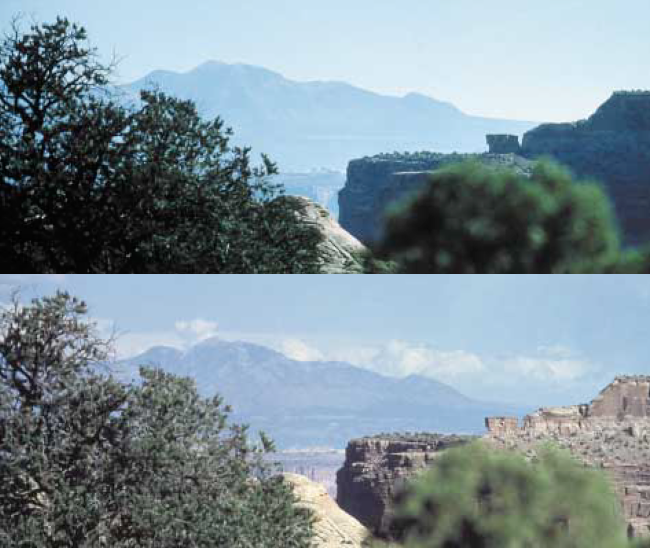 1 The effect of progressively shifting Sun angle on the appearance of a vista as seen from Canyonlands National Park. 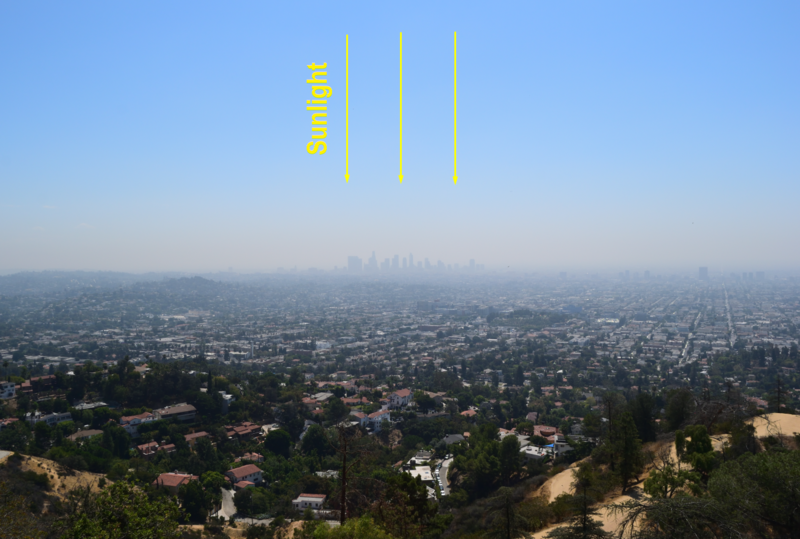 In each image air quality is the same. 1, 2 – represents a moment after sunrise, when the Sun angle-vista-observer geometry results a large amount of scattered light added to the sight path, which is caused by forward scattering; 4 – a vista around noon, when angular distance to the Sun is the biggest, hence visibility is the best (Malm, 2016). Pic. 2 The effect of changes in Sun angle as well as the cumulus clouds effect in the La Sal Mountains. Top image shows the vista during morning, a bottom one the same vista during the afternon hours. (Malm, 2016). Situation changes rapidly when looking on the distant objects around sunrise or sunset. To be more precisious, very important moment of day is a golden hour with Sun above horizon. This is the time, when surrounding view changes in general. For the Sun angle-vista-observer geometry is very unfavourable due to forward scattering, which increase at the solar azimuth, as Sun goes down. Conversely to solar azimuth, the Sun altitude is low enough to give a decent view towards antisolar direction. The view towards opposite side to the solar position is good during a whole period between noon and golden hour, however when Sun is located lower on the sky, then view appears to be the best. This is driven by the extinction, which starts play a big role, hinering some part of direct sunlight on a longer way throughout Earth’s atmosphere. It results a bit less amount of light scattered on haze particles and molecules, giving a view more discernable. Remote mountains has a bigger contrast against the yellowish sky beyond then (Pic. 3). Pic. 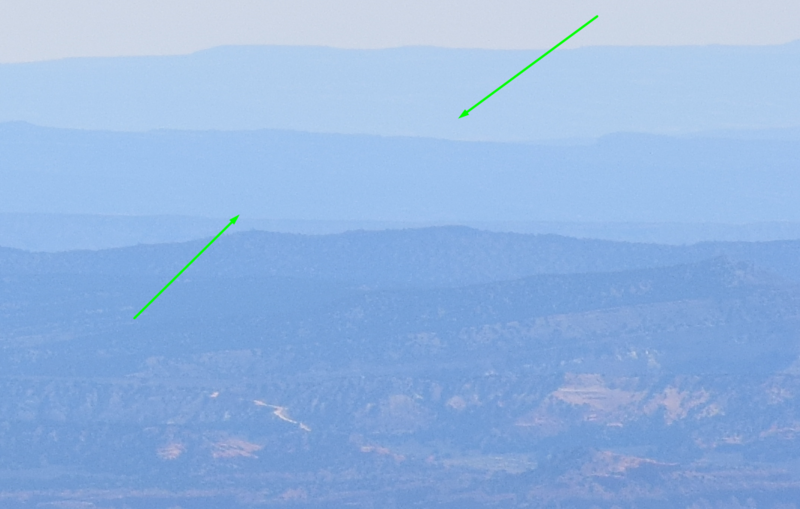 3 Comparison of the visual range at the antisolar point during the morning hours, where upper image shows a view at 15min after sunrise and lower shows the same view about 1,5h after sunrise. On the left the northernmost part of the Gomera island with Roque de Fuera at 43 km distance. 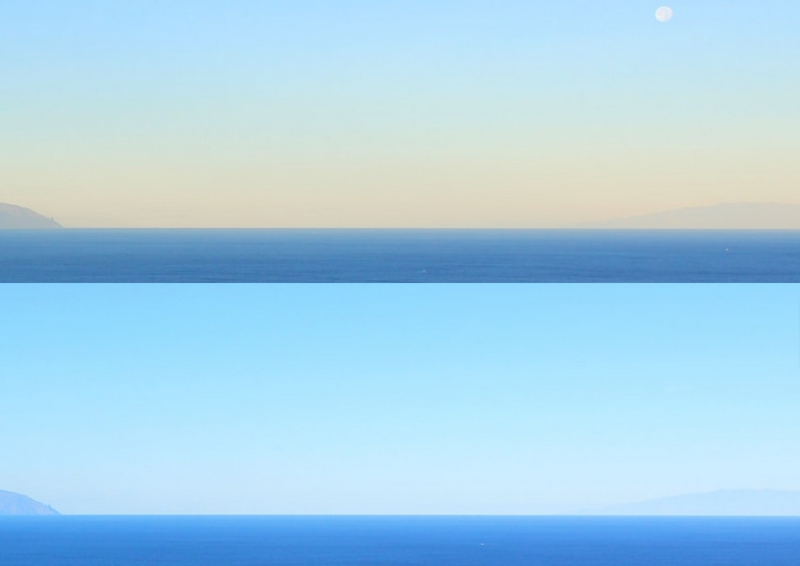 On the right a south part of La Palma island as seen from about 110 km distance. 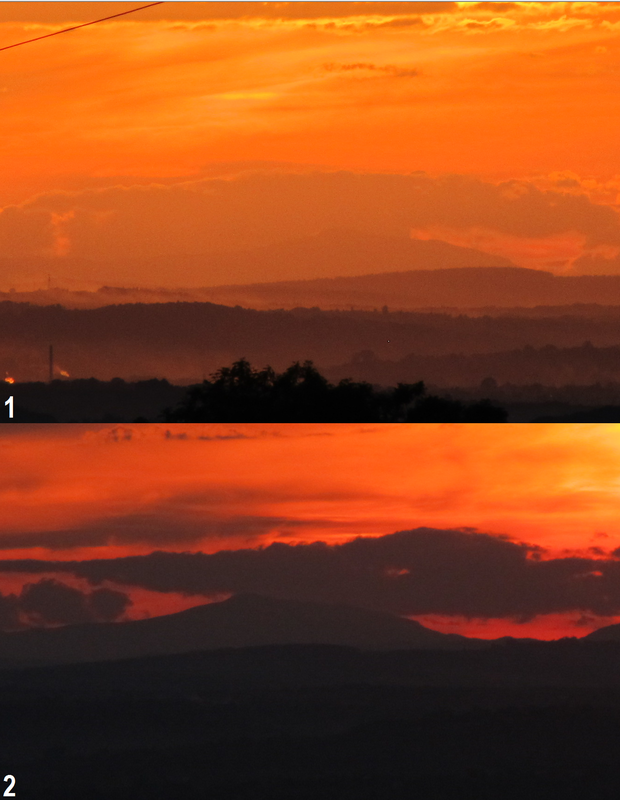 The visibility appears to be slightly better at the golden hour time on upper image. Webcam location the Royal Sun Hotel near Los Gigantes at the Tenerife island (Deckchair.com). When sunlight diminishes around sunrise or sunset then remote objects seems to be visible better in all directions, except a rough solar azimuth. This is the time, when direct sunlight scattering on aerosols vanishing (Pic. 4, 5). 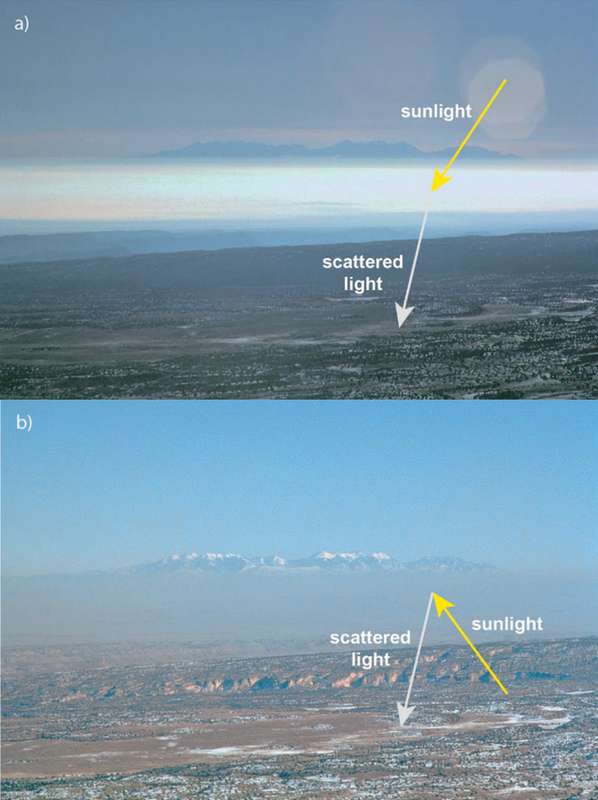 In direct sunlight conditions the haze particles or air molecules eliminates the visual contrast that would have made the most distant horizon visible. The contrast changes are depend on illumination and extinction coefficient. Pic. 6 A visual range comparison on shifting solar position at the same moments against sunrise and sunset. Comparing to the Pic. 3 and Pic. 4 both vistas appear to look the best due to tailing off a direct sunlight scattering on the near-ground conditions. View from Royal Sun Hotel near Los Gigantes at the Tenerife. (Deckchair.com). The extinction coefficient means how quickly the beam is attenuated as it passes through the medium. Small extinction coefficient means, that the medium is relatively transparent to beam. For example our beam is remote object and medium is the air. Dimishing and dissapearing sunlight when sky remains bright push the contrast treshold of the human eye makes the distant target visible (more details in the next part of this article). The air molecules and haze particles don’t scatter the sunlight anymore. Sunset marks the moment, when forward scattering disappear. Opposite situation occurs daily at sunrise, where forward scattering appear again. This moment is called a sunrise or sunset transition, which has been described more in my previous article. A practical explanation of this phenomena can be found on Pic. 6, when looking at points A and B marked by red arrow. 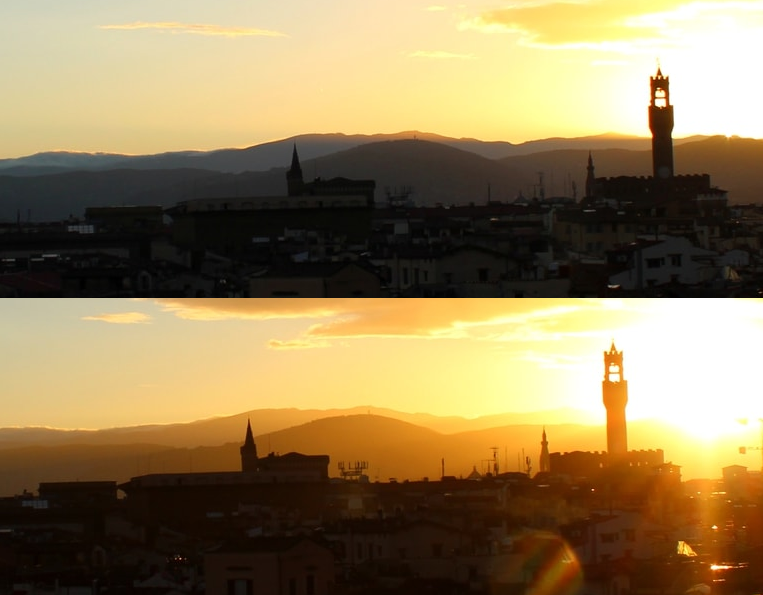 They shows a rough sunset transition moment, which changes a visual range abruptly. At the Pic. 6, image 2 the point A is an example, where forward scattering still occurs due to direct sunlight presence. Point B is arleady shaded with lack of direct sunlight scattering, what makes far better contrast against still illuminated lower part of the atmosphere. It makes, that our object is perfectly visible. Forward scattering usually makes object less visible than backward scattering. When forward scattering dissapear it gives way to see the remote objects, that we were not able to see during the sunlight conditions (Pic. 7). Pic. 7 A visual range comparison at the sunrise transition moment, where a forward scattering starts to play a serious role. View from the Westin Excelsior at Florence towards Tuscan-Emillian Appenines ranges located 15-25 km ahead (Deckchair.com). Pic. 8 A perfect example of sunset transition. 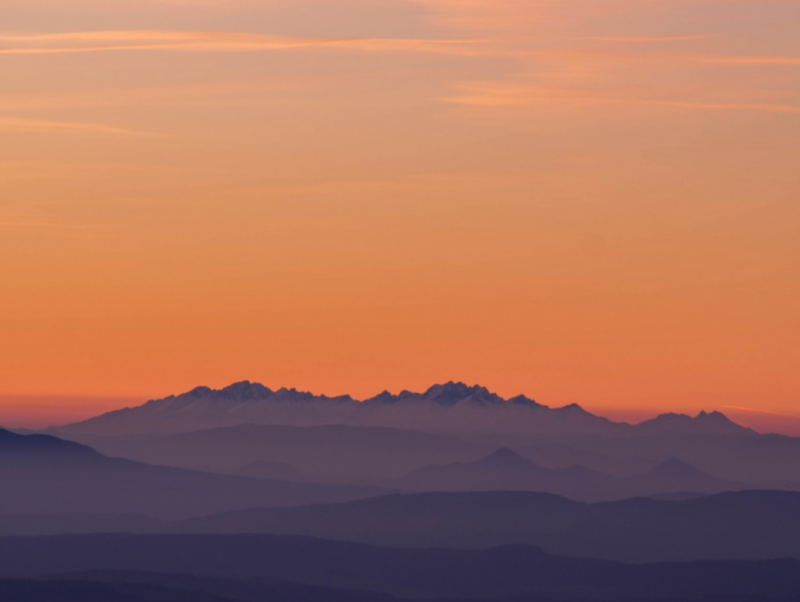 Tatra Mts seen from about 130km distance (Poland), where yellow arrows show a peaks, located behind still illuminated haze, where a direct sunlight scattering plays a main role. Conversely the shadow, marked blue, is deprived a direct illumination. 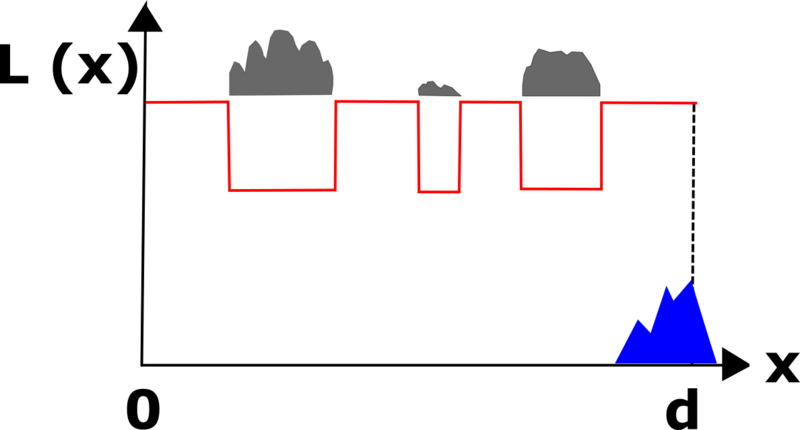 Illuminated peaks marked by yellow arrow are much less visible than others. 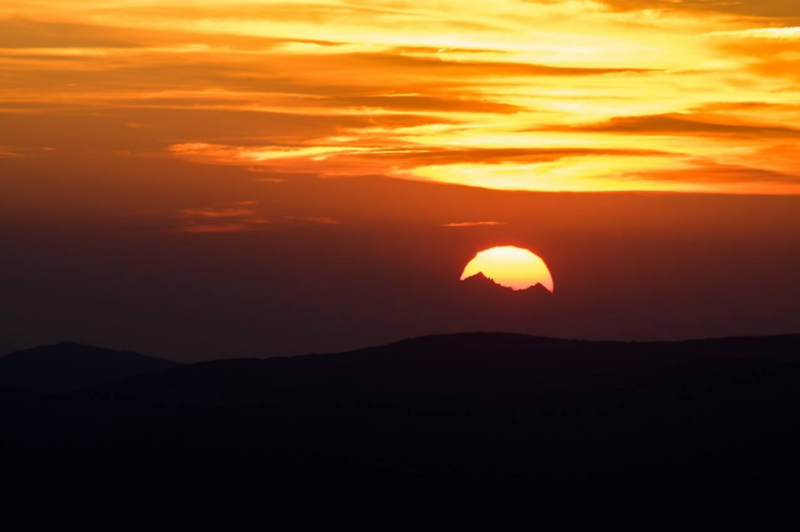 This situation can last even a few seconds, until the Sun hides behind mountains afterwards, making them all perfectly visible (credits: Damian Bogacz). After the sunset, light scattering take place in the atmosphere. For our line of sight we face a secondary scattered light, present in the lower, shaded part of the atmosphere. Moreover mostly the atmospheric aerosols has an extinction coefficient decreasing in magnitude with increasing wavelength (Horvath, 1967). Pic. 9 An visual range comparison when Sun is 3 deg below the horizon at the simmetrical moments against noon. In this case much better view is at the evening, when Gomera and La Palma are located near the solar azimuth. View from Royal Sun Hotel near Los Gigantes at the Tenerife. (Deckchair.com). Pic.10 A visual range comparison when Sun is 6 deg below the horizon (civil twilight) at the simmetrical moments against noon. In this case much better view is at the evening, when Gomera and La Palma are located near the solar azimuth. View from Royal Sun Hotel near Los Gigantes at the Tenerife. (Deckchair.com). We have to bear in mind that a favourable visibility conditions after sunset will last as long as the stratosphere (ozonosphere) is illuminated (Pic. 10, 11). After this the light scattered in upper part of the atmosphere is too weak to make a good contrast with distant object observed. Pic. 11 An visual range comparison when Sun is 9 deg below the horizon at the simmetrical moments against noon. In this case much better view is at the evening, when Gomera and La Palma are located near the solar azimuth. At the evening, the La Palma is near the “edge” of stratosphere illuminated , hence is becoming invisible for the observer. View from Royal Sun Hotel near Los Gigantes at the Tenerife. (Deckchair.com). Pic. 12 An visual range comparison when Sun is 12 deg below the horizon (nautical twilight) at the simmetrical moments against noon. In this case the visible objects appear only at the solar azimuth during the evening, unless Moonlight dominates on the sky, making objects visible (after longer exposure) even at the antisolar direction. View from Royal Sun Hotel near Los Gigantes at the Tenerife. (Deckchair.com). In the nightime hours is really hard to distinguish some distant object, unless they are illuminated by local light pollution or moonlight. In the second case everything is going to be analoguous to daylight conditions, however capturing a proper pictures will require a long time exposure, unlike to webcam example provided. (Pic. 13). Pic. 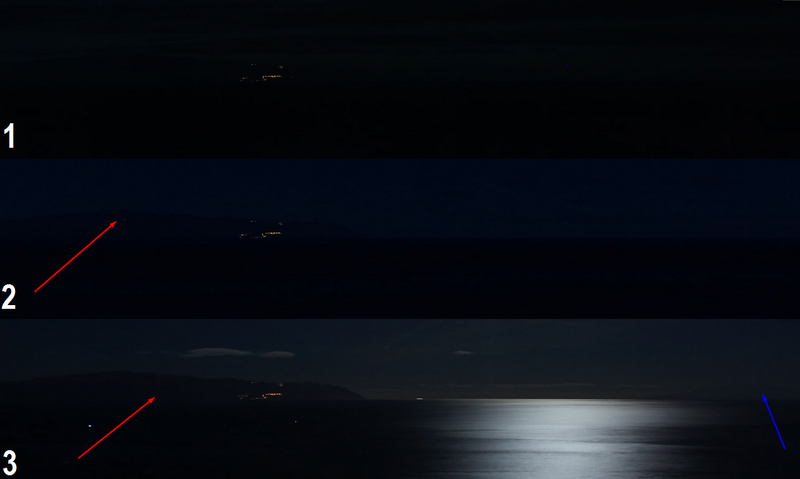 13 A Gomera and La Palma island seen from the Tenerife, where: 1 – moonless night, 2 – moonlight with antilunar direction, 3 – moonlight with the Moon-vista-observer view geometry. View from Royal Sun Hotel near Los Gigantes at the Tenerife. (Deckchair.com). Pic. 14 An example of visibility conditions during the night at 3rd quarter Moon and some light pollution in places. A view from the Turbacz mountain hostel towards the Łososina range, seen from about 40km and captured by simple compact camera Canon A540, ISO 100, 15s f.2/6, gamma modified. Now let’s see an example of perfect quality of distant view in the night conditions, as we can gain with long exposure and light pollution assist (Pic. 15). Pic. 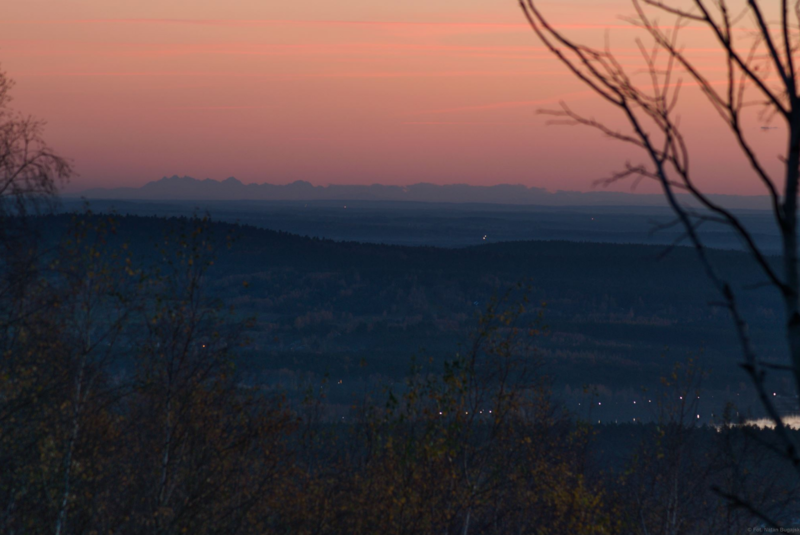 15 Tatra Mts seen from Pradziad, 200-240 km distance (credits: Artur Robak). To summarize this section I would like to show the visibility conditions under a different Sun position against the horizon at the antisolar direction, unaffected by forward scattering. Pic. 16 The visual range comparison within different solar position altitude horizon at antisolar direction, where: 1 – 4 deg below the horizon; 2 – 3 deg below the horizon; 3 – 2 deg below the horizon; 4 – 1 deg below the horizon; 5 – sunrise; 6 – 5 min after sunrise; 7 – 15 min after sunrise; 8 – 1h after sunrise. 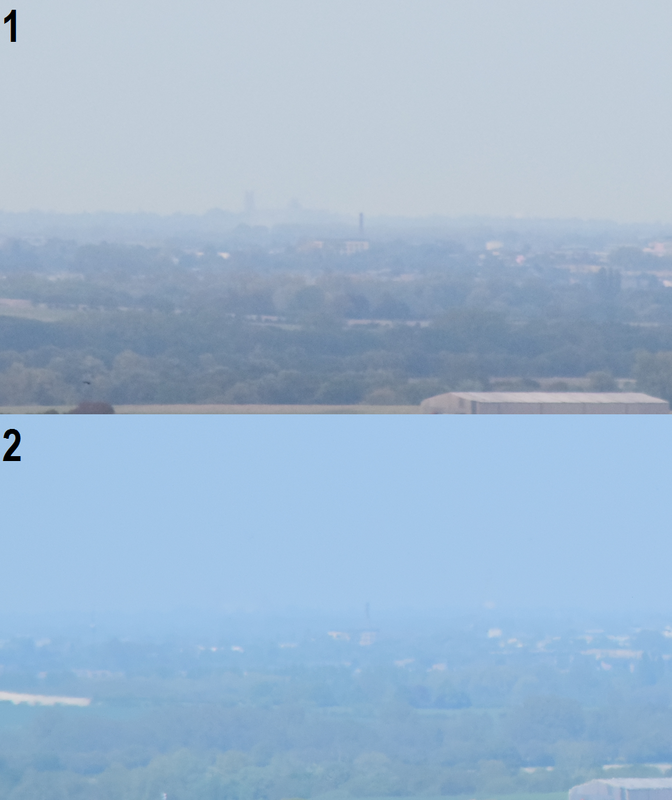 Optionally image 7 shows the best conditions for long distance observations as well as potentially image 5, where a distant view unobstructed by illuminated haze can be merged with the horizon not bright enough. View from Royal Sun Hotel near Los Gigantes at the Tenerife. (Deckchair.com). Looking on pic. 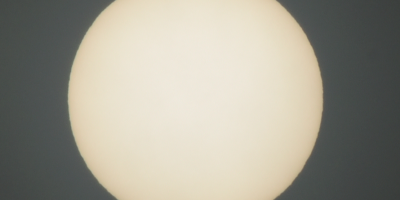 16 we can say straight, that the best visibility conditions at the Sun – observer – vista geometry occurs about 15-20 min after sunrise or before sunset, which has been marked at image 7. Some of you will ask, why particularly at that moment, whereas image 5 shows even better condition for La Palma island. The point is, that the sunrise or sunset transition at antosolar direction is to be seen at the sky too. In the consequence these objects, which lies very far from the observer can be merged with receeding civil wedge, that makes horizon still not bright enough. Only the prominent mountains, which are high enough, can rise above this line, making a decent contrast between themselves and bright sky beyond, as the La Palma island does in the example provided. Below I have gathered all major moments, when visibility towards particular direction changes throughout the day (Pic. 17, 18). It’s good to mention also about a seasonal variation of the sunrise and sunset azimuth, also in understanding with civil and nautical twilight azimuth, which can improve or deteriorate the visual range at particular direction. An improtant astronomical factor, which can decide about seeing the distant objects, even when they are totally hidden behind a thick haze is solar ephemera. Knowing roughly an azimuth of sunrise or sunset we can try to capture an distant mountain on its disk (Pic. 19). It also works in case of Moon, however when haze is too thick Moon tends to dissapear before set. Pic. 19. Sunset roughly above Tatra Mts, as seen from Połonina Caryńska in Bieszczady (Poland) at about 170km distance. Normally these mountains were invisible that day (credits: Adrian Weimer). An lunar ephemera may help to capture a distant object only when haze concentration is low. Then a moonrise or moonset above some remote and not illuminated enough object will be beneficial (Pic. 20). Pic. 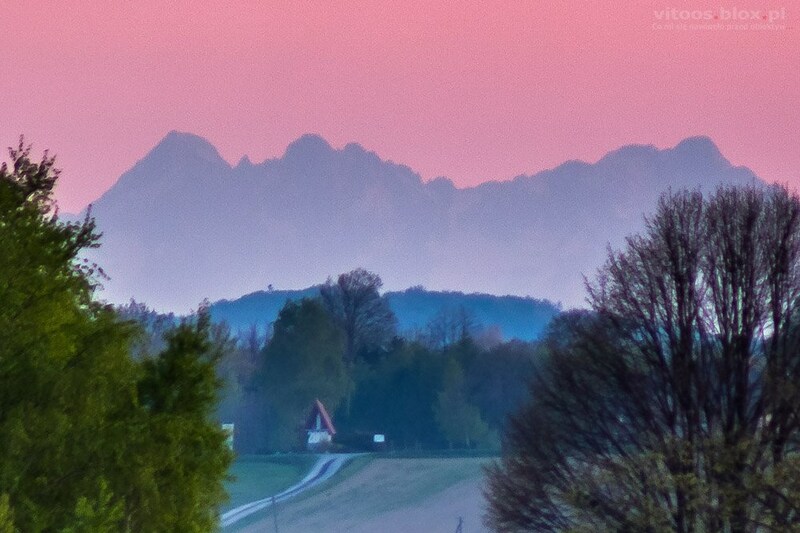 20 Stacked moonset above the Tatra Mts. 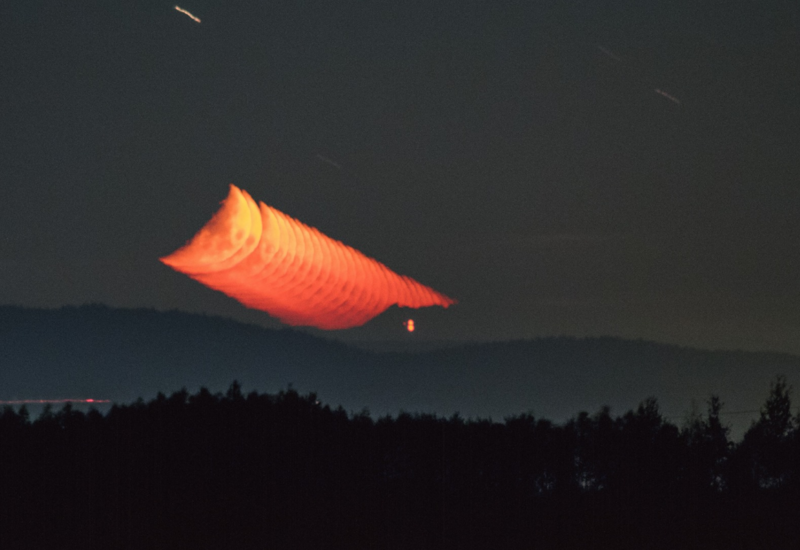 as seen from about 130km distance (credits: Tomasz Ziajor). A details of cheking the solar and lunar ephemeras has been described in this article. Every air mass provides a different conditions of horizontal visibility. I am going to remind a bit some stuff from my previous article, where I shortly explained the air mass influence on the visual range. Basically the map below shows the types of air masses, as influence on the weather thoughout the year (Pic. 21). Pic. 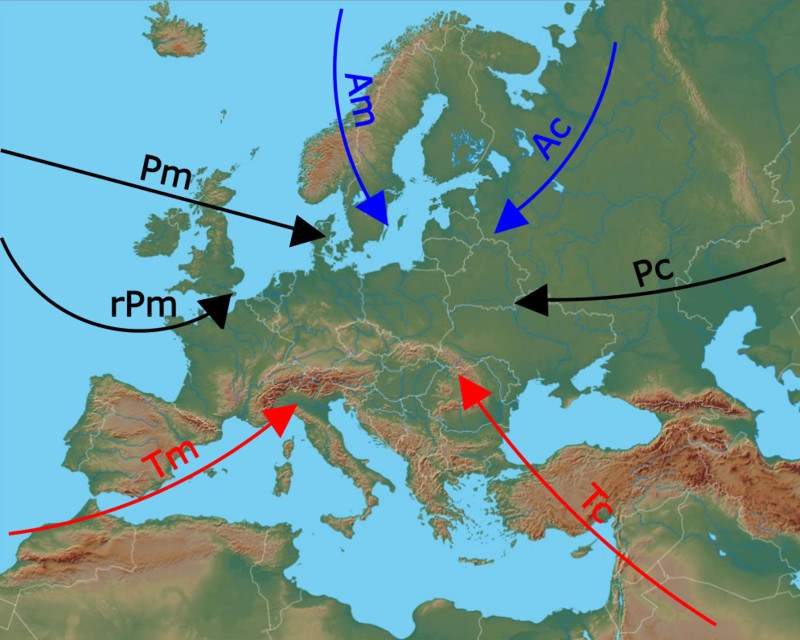 21 Type of air masses creating a weather conditions in Europe throughout the year (based on Europe physical map from Geology.com), where: Ac – Arctic continental, Pc – Polar continental, Tc – Tropic continental, Tm – Tropic maritime, rPm – returning Polar maritime, Pm – Polar maritime, Am – Arctic maritime. The Arctic air mass, which we can divide on continental and maritime one is the clearest, which comes to Europe. The reason of its transparency lies in the lowest amount of particles coming from local basement. The polar regions are (at least now) mostly covered by ice and snow, hence all particles, which could potentially be blown by wind are trapped underneath. It makes the arctic mass the clearest air mass, as we can see. However it’s good to point out, that the clearest is the Arctic continental air mass, which comes to Europe from Barents Sea direction. The Arctic maritime air mass may contain some marine aerosols, which will impair the visibility a bit. Moreover this kind of air mass always feature a bigger humidity level (showers in places), which is unfavourable for visibility too. Because of increasing light pollution around the Globe we must be aware, that arctic air mass contains some arctic haze, which enter from lower altitudes and urban areas through the long range pollution pathways. An Arctic air mass comes to northern and central parts of the Europe. Usually this air mass is transformed, when enter on southern part of the continent. Polar maritime air mass is another common air mass, which influences into the weather in Europe. Within this air mass we can make a division between Polar maritime air mass and returning Polar maritime air mass. The second one arises out of a longer journey above the sea surface, which takes the air first southwards the North Atlantic and next north-eastwards towards western Europe. In general, Polar maritime air mass brings good, or even excellent visibility depending on the period of the year, when hit the ground (is ground warmer or colder) and local weather patterns (some showers in places may strongly interrupt a visual range). We can expect this air mass, when wind blow from west and north-west towards the Europe. A returning polar maritime air mass feature only moderate visibility due to a big humidity and marine aerosols concentration. It comes usually from WSW and SW directions to the continental Europe. Pic. 22 A Tatra Mts seen from Wielka Rawka at Bieszczady Mts (Poland), located about 170km ahead. The photo contains a vista under 2 different conditions, where: 1 – at the Arctic continental mass influence; 2 – at the Polar maritime air mass influence. Basic difference between these 2 masses lies in transparency. Because artcic air mass doesn’t contain a haze, the observer is cabable to distinguish even a relief of distant object, rather than outline only, which is featured by polar maritime air mass, due to a maritime haze presence. Anyway in both cases we can say, that visibility is excellent (Image 1 credits: Dominik Jakubowski). Polar continental air mass influences a bit less into the weather in Europe, because the western winds takes hold for most of the year on the continent. However, during the winter period the frequency of this air mass is bigger, than during the summer. Next to more extremal temperatures, as we can observe under this air mass condition, the visual range is rather moderate or good, but not perfect. Despite of low level of humidity this kind of air mass may contain a lot of continental haze (rural continental aerosols) or some pollutants, especially during the summer. In winter, when the eastern Europe is covered by snow, this air mass feature better visibility conditions. Pic. 23 View on Ely Cathedral from New Farm at Reed near Royston (UK) at 47 km distance, where: 1 – view at returning Polar air mass influence; 2 – view at Tropic maritime air mass influence. A returning air mass influence brings usually a moderate or at most a good visibility with range about 100 km. Pic. 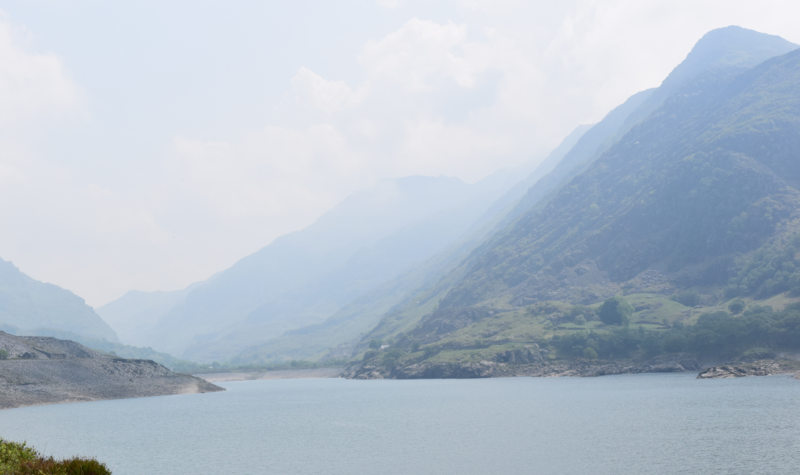 24 View from Llanberis, Llyn Peris to towards Pen Y Pass and Mt. Snowdon range (UK), located only 8 km ahead. This is an example of extremely poor visibility due to strong Tropic maritime air mass influence on much colder ground spreading through the Cambrian Mts. Tropical maritime air mass usually coming to Europe from south west. In all period of year this air mass bring higher temperature and big humidity, which results a really poor visibility. Because this air mass is originated at tropical latitudes, it features very often higher themperatures, than the ground underneath, which leads to additional humidity increment. Tropical continental air mass is the last type of air mass, that enters to Europe from time to time. Likewise a maritime one, the tropical continental maritime usually plays a big role in Mediterranean region, unlike to central Europe, where comes ocassionally. Usually this type of air mass brings much higher temperatures and dry air, often abundant with dust from the desert. In this configuration, combined with usually colder surface, the visibility conditions are also quite poor, or at most moderate. Pic. 25 View from the Wielka Rawka peak at Bieszczady Mts towards invisible Tatra Mts under Tropic continental air mass influence. The planetary boundary layer has been strongly emphasized due to a high dust concentration (credits: Robert Bogacz). Because this article can read people from another part of the world I would like to mention another two major air masses, that are an equatorial and antarctic one. Equatorial air mass has only a maritime features. Usually brings a frequent thunderstorms and high temperatures. In this case the visibility conditions are usually restricted and depends on local weather pattern only. However even in this climes some days with decend visibility can be recorded (Pic. 26). Higher air mass temperature has an ability to storage a bigger amount of water, decreasing a humidity level at once. Pic. 26 Partially covered by cumulus clouds the Raung volcano as seen from the Uluwatu Temple (Indonesia) at about 140km distance. This is one of the most distance views as we can get under an equatorial air mass conditions. Picture has been dehazed a bit. Antarctic air mass has only a continental features due to massive land surrounding a south pole. This air mass appears to be the clearest air mass observed on the Earth, especially now, when ice sheet on arctic area has been melting down. 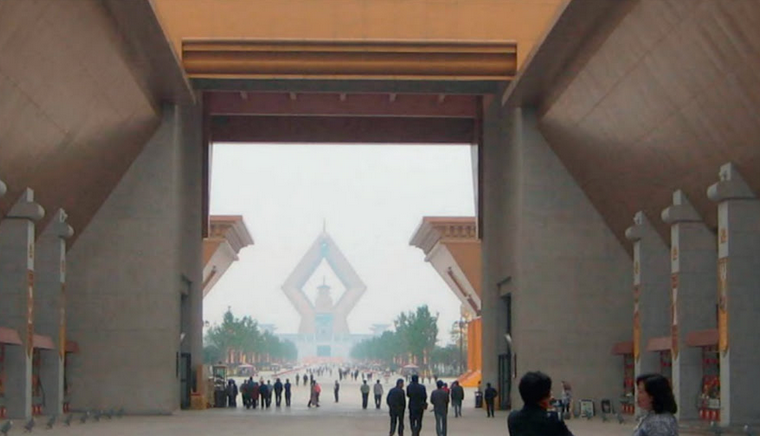 This the most transparent air mass can be polluted only by arctic haze, which origin is the same like in the arctic. Previously I have considerated the usual characteristics of the visibility conditions in main type of air masses, however there are many variations in individual air masses (Ackerman, Knox, 2007). – Day – night – day humidity variations – the humidity is getting lower as day warms, hence visibility is believed to be better during the middaytime hours and usually the best on the early afternoon, which is the warmest period of the day (Pic. 27, 28). A humidity level can be also modified by wind speed. Pic. 27 A humidity changes between 29.11 and 1.12.2018 on Rzeszów (Poland). The lowest level of humidity tends to occur on the early afternoon, when weather is stable (Meteo.icm.edu.pl). Pic. 28 An percentage of the visual range throughout the year at the Gaik-Brzezowa weather station on Carpathian Foothills (Lesser Poland). 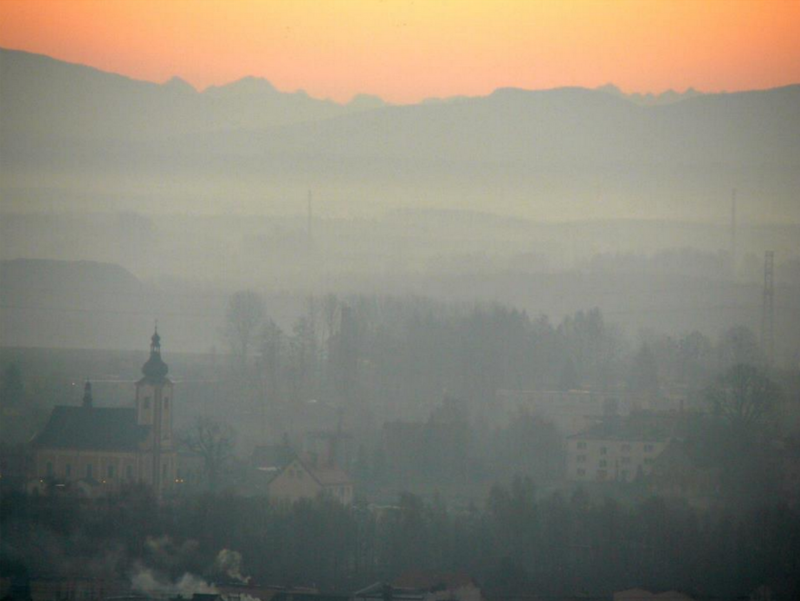 The chart clearly shows, that the best visibility appears to be at the early afternoon in southern Poland (credits: Grzegorz Luranc dissertation). – Air turbulences – plays also a huge role throughout the day and is strongly associated with the humidity variations under convective weather conditions. When temperature rises, the steaming from the ground rises too and vertical turbulent updrafts become stronger. More intensive steaming from ground leads to increased humidity, which next is transported up, resulting a cumulus clouds development, just above the planetary boundary layer. This humid air is superseeded by drier air, coming from “free atmosphere”, that penetrates down. The result of this phenomena is easy to spot between morning and early afternoon. On the morning our vista is misty, whereas sky is free of clouds. After a few hours, when vertical developped clouds drift across the sky, our vista is a bit more clear. These situations can be observed usually during a warm period of the year. – Atmospheric pressure – a high atmospheric pressure leads to low wind speed, which causes increased pollutant concentration close to the pollutant sources and visibility deterioration (Majewski et. All, 2015) unlike to low pressure, which due to increasing wind speed provides effective ventilation especially for urban areas. The low pressure conditions are associated with convective weather, as described above. A convective weather produces a low pressure areas with convergence winds. Low pressure area is produced at the boundary between warmer and colder air mass. More information about this will be provided in the next section. Opposite situation occurs under anticiclone weather conditions, when atmospheric pressure is higher. Then weather can be more stable for longer time, resulting a subsidence inversion development. This subsidence inversion can develop up to 2 km above ground depending on the pressure level. The subsidence inversion is a result atmospheric pressure increasing, which leads to air compression and heating. Warming of this air increases evaporation, causing usually clear skies within high pressure systems. This inversion resists convection of surface air, since the surface air is stable and causes air pollution to be trapped at the surface. In the result the visibility is really poor within this inversion layer, unlike to the area above, which is unusually clear due to unusually dry air (Pic. 28) In the meantime underneath, where visibility is higher, some horizontal cloud development may occur. These clouds are difficult to disperse during the winter, when Sun shines too low above horizon and provides too weak radiation. Pic. 29 A good example of subsidence inversion at Mala Fatra Mts. (Slovakia), which strongly divides the areas of opposite visibility conditions. Moreover in places a stratus clouds are produced. the height of this inversion depends on the pressure (Astropolis.pl). Subsidence inversion is different between winter and summer. In warm period of the year, this inversion is less pronounced, at least during the day, when tails off due to much stronger solar radiation unlike to winter. Hence we won’t observe a vast visibility difference between inversion layer and layer above, as we can see in colder part of the year. – Temperature – is also important weather element, which merges with pressure and humidity issues. Once temperature is higher, then the water, being on the ground has a bigger ability to evaporation, however a single air cube has a bigger volume at once. Then in wet areas, especially when water is colder than air the visibility conditions won’t be favourable. On the contrary rising temperature above dry (or frozen during the winter) land mass will decrease a humidity, making a visual range more extended (like at the desert areas in western USA). Inside the inversion layer, where temperature is lower, the humidity level is higher, what we can see in a mist, fog or partially developed cloud deck. – Seasonal variations – can be significant, depends where you live. In marine climes there won’t be as considerable difference as in continental climates. However in general the time with the best visibility occur during the winter, when low temperature hinders steaming from the ground and when cooler and clearer air masses take hold. For instance a dry continental Polar or Arctic mass usually extends visual range during the winter, because these masses travel across a massive land covered by snow. However it refers to upper part of the air, which lies above the inversion layer, described below. A season with the worst visibility is the summer, when high temperature causes intensive heating and steaming from the ground and water. Then humidity increases, impairing the visibility. This situation can turn rapidly when much colder air mass approaches, what happens from time to time, usually after heat wave. Then, if the surface over which an air mass is located is warmer than the air mass, the lower layers will be heated. It incurs the decrease of humidity and good visibility. This situation is observed when colder maritime air mass comes on warmer continental surface (Pic. 30). Opposite situation can be observed during the spring or winter, when much warmer air mass comes onto the surface, which is colder. Then the lower layers are gradually cooled. In the result water vapour and atmospheric impurities tend to be concentrated in low layers decreasing the visibility effectively (Pic. 31). Pic. 30 One of the best visibility conditions are just after passing a cold front and entering a colder Polar marine air mass on much warmer surface. 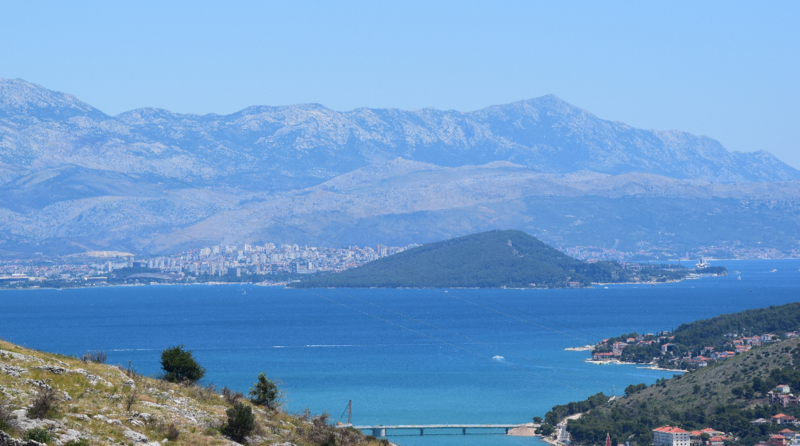 Split and Biokovo Mts beyond (Croatia), seen from 35-40 km distance. Pic. 31 One of the worst visibility conditions after entering much warmer Tropical maritime air mass onto colder area. 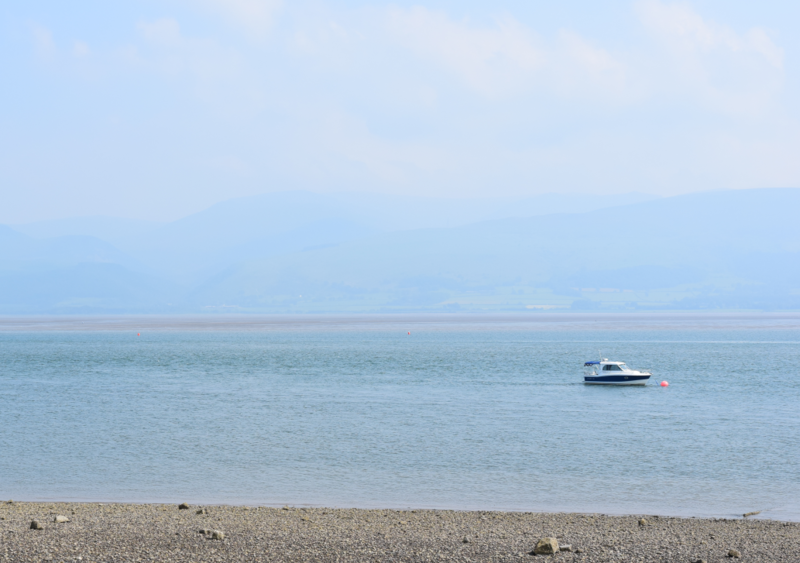 View on Carnedd Llewelyn 1064m in Snowdonia National Park from Beaumaris at Anglesey island, located at only 14 km distance. Except the tropic air mass advections, spring an period feature one of the best visibility conditions, becuase the temperature is still low and ground still cool, which prevents of steaming. Polar continental air mass, which enters to Europe doesn’t contain much aerosols, because this mass originates above still snow covered (or if not, wet) areas of Eurasian inland. Arctic air masses can also occur during this time. Autunm is a period with also good visibility, when a Polar maritime or Arctic mass occur. During this time a poor visibility can be observed during Tropic and Polar continental air mass advections. Another favourable factor for a good visibility during the autunm is a limited cloudiness in this period of the year. The situation will be different i.e. in USA, where an excellen visibility is observed also during the summer. It arises out of a dry huge massive of land and high temperatures. Moreover the period of the worst visibility doesn’t indicate, that a monents with a good atmospheric clarity won’t occur. It depends on the local weather pattern, being various between years. – Wind speed and direction – an good example here is the Foehn – a rain shadow wind (Pic. 31), which passes over the mountains and loose most of its moisture on winward slopes. Pic. 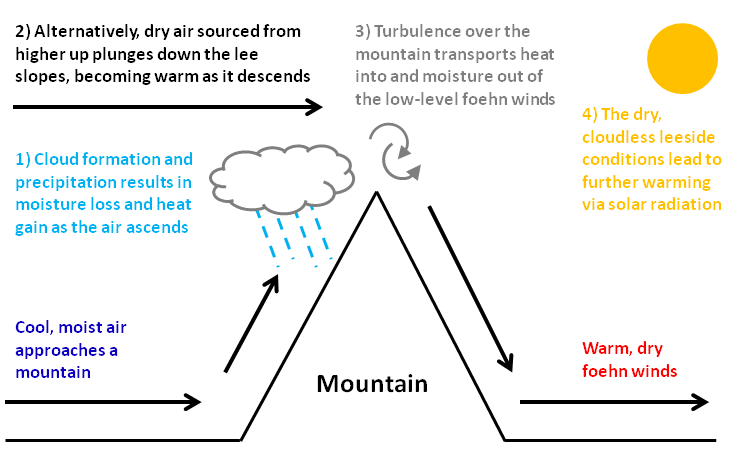 32 A general mechanism of the foehn wind occurence (Wikimedia.org). Being deprived of humidity at leeward side this wind brings a good or even perfect visibility conditions next to the pleasent warm (Pic. 32). 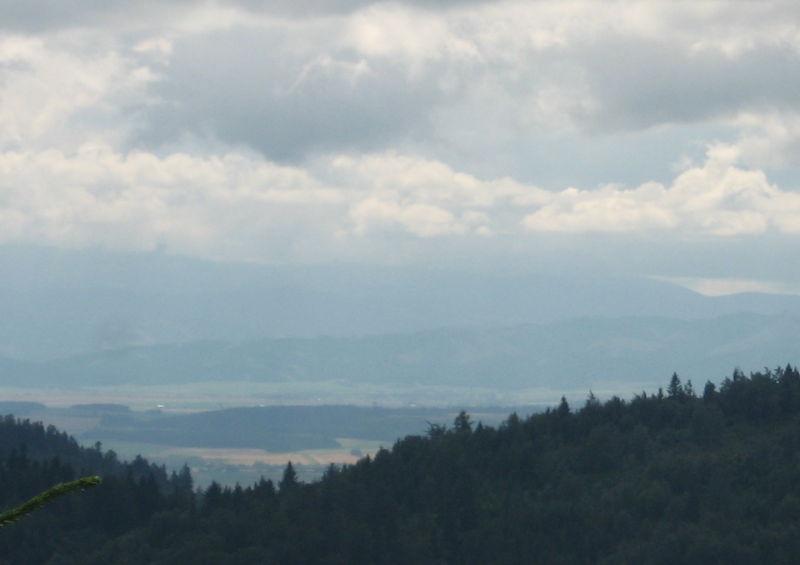 Usually watching the main mountain range, above which a Foehn wind passes over an observer can spot a cloudy wall. Pic. 33 A foehn wind can bring an excelent visibility conditions with achieveable visual range up to 200km or even more. Tatra Mts with foehn wall cloud as seen from about 200 km distant Świetokrzyskie Mts (Poland)(credits: Natan Bugajski). Wind plays a leading role in clearing the atmosphere from air pollutants. Usually under windy conditions the visibility appears to be better. On coastlines, when wind is strong a lot of foam and seawater droplets is risen from the seafloor reducing the visibility considerably (Pic. 34). Pic. 34 A strong wind blowing from the sea can rise a lot of water droplets and maritime aerosols, making a misty appearance. 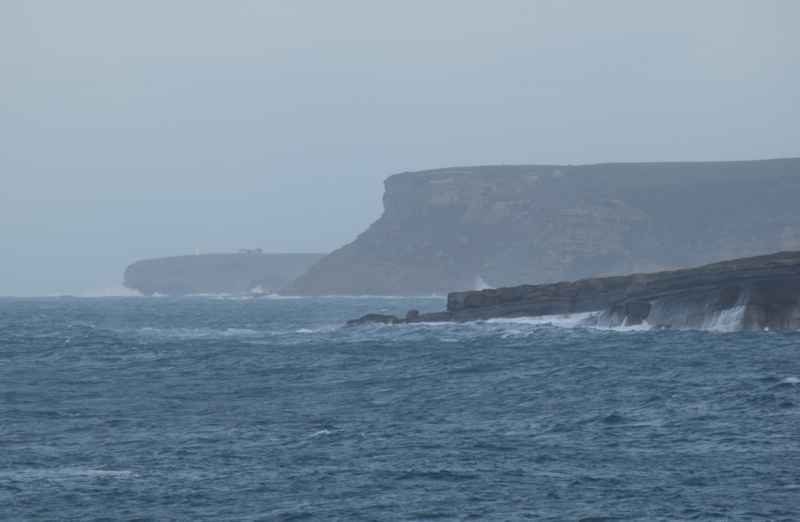 View from Santander coastline near Palacio de Magdalena on Faro de Cabo Ajo with lighthouse at the 15 km distance. – The atmosphere density – varies in a vertical profile. As height increases the density of the atmosphere is lower. The most dense atmosphere is in the lowest part of planetary boundary layer, which is called as an surface layer (Pic. 36). Usually the visibility range is the worst there, and improves as altitude increases (Pic. 35). We can often see it on the pictures with a separated mountain ranges, which apear to look slightly more fuzzy at the bottom. However in very transparent atmosphere conditions this phenomenon appears too and can be mistaken with the Mach Bands optical illusion, which has been described in my previous article (Pic. 37). A considerable improvement of the visibility is noticeable when crossing the planetary boundary layer or at least the inversion layer. Pic. 35 A Navajo Mt. 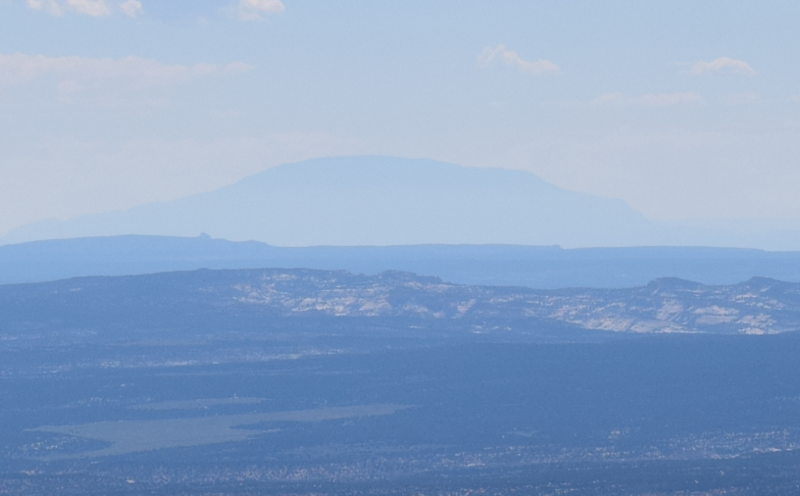 as seen from Bryce Canyon National Park at 131 km distance (Utah, USA) is a good example of visual rang echanges in vertical profile. Whereas a top of the mountain is transparent, the bottom slopes plunges in haze, which become bigger as close to the main ground level (surface layer). Pic. 36 Zoomed view on Tatra Mts from Zagorzyce (Lesser Poland) at about 130 km distance with clear influence of the surface layer with slightly bigger haze concentration (credits: Witold Ochał, Vitoos.blox.pl). Pic. 37 A few separate mountain ranges seen from one place looks a bit different due to haze presence, especially in surface layer. However under excellent visibility conditions the surface layer haze can be easily mistaken witch the Mach Bands optical illusion. Bryce Canyon National Park – looking towards Grand Staircase-Escalante National Monument, Utah, USA. – Cloud cover – this is ambiguous for visibility conditions. In general the clouds should’t affect on air transparency, although their presence interrupts a visual range so much. First of all, the “safiest” cloud decks for visibility conditions are the high-level or some mid-level clouds (i.e. cirrostratus, altostratus), which prevents a vista from solar beams and their scattering. ot top of that these clouds often make a better contrast with distant objects, at least during the day (Pic. 38). More details about this I wrote in next section below. Once lower levels of clouds or vertical developped ones are present on sky, then our visual range can be interrupted. Some prominent mountain ranges can appear on the same level or even above the cloud layer and be invisible for observer (Pic. 39). Pic. 38 Low Tatra Mts. (Kralova Hol’a) seen from Magura Wątkowa (Poland) from about 120 km. Sky was veiled by cirrostratus clouds, that made a whitish appearance, giving a better contrast with remote mountain outlines. Pic. 39 Low Tatra Mts (Kralova Hol’a range) as seen from Veterny Vrch summit (Spisska Magura)(Slovakia) at about 60km distance. Despite decent visual range under Polar maritime air mass the mountain ranges are not fully visible for observer due to thick thunderstorm clouds presence. For longer distances the mountains can merge with clouds and being totally invisible. Situation changes, when Sun is below the horizon enough, being not able to illuminate the clouds, which for solar direction means a moment of civil twilight (for high level clouds only). Then clouds usually reflect a light scattered in the atmosphere (or another remote clouds) only, which is too faint to give them a bright appearance. Contrasting with still bright section of sky around solar azimuth, these clouds looks dark grey or completely dark at deeper twilight. In the result a contrast between them and distant objects is really low. Even if visibility is very good an observer is not able to spot the remote mountain (Pic. 11, 40), unless the clouds are patched in places (Pic. 41). Pic. 40 View from Royal Sun Hotel near Los Gigantes at the Tenerife towards La Palma island located about 110 km ahead (marked by red rectangle), which is covered by thick and shaded stratocumulus cloud, which reflects the light only scattered in the atmosphere. In the result it appears to look dark grey likewise the mountainuous island beneath. It makes a very low contrast between the cloud and island, making this land almost invisible (Deckchair.com). Pic. 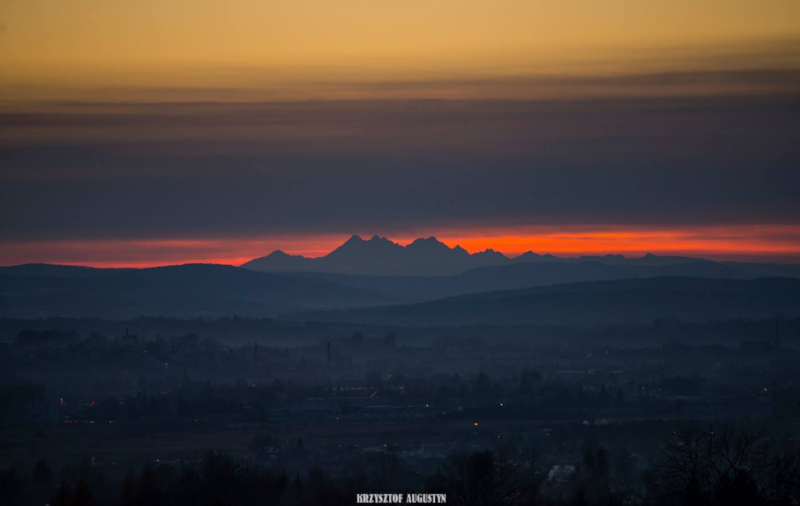 41 When cloud layer is patched or thin enough, then even after sunset a remote mountains can be visible (Tatra Mts seen from about 130 km distance)(Poland)(credits: Krzysztof Augustyn). In general as long as the high-level cloud reflects direct sunlight, even red, the contrast between shaded distant mountain below is decent to make it still visible (Pic. 42). Unfortunately it happens only, when the clouds are thin enough, leading a solar beams to overexpose them. Otherwise their bases won’t be able to make a good contrast with distant land, what is perfectly visible in case of stratocumulus clouds versus for example a cirrus ones. Pic. 42 A zoomed view on Mogielica Mt. 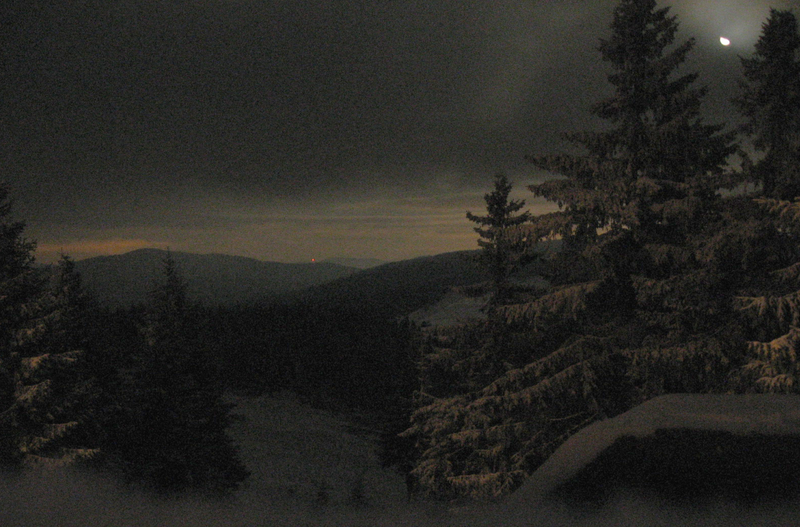 from the Dynowskie Foothills at about 110 km distance (Poland). 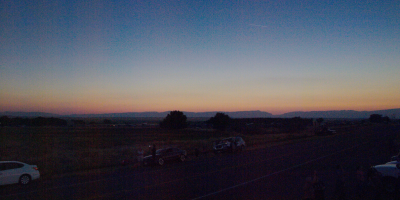 Comparison of the vista just before and just after sunset with high level cirrostratus clouds and mid-level stratocumulus clouds present on the sky. In both cases the stratocumulus cloud, because of their thickness deteriorates the vista considerably, when located at the observer – object – cloud geometry. Cirrostratus, because is thin enough, remain overexposed and as long the Sun illuminate it, the contrast with distant object is fair enough to make it clearly visible. Previously I described a weather elements, which can influence onto visibility conditions within one particular air mass. Now we should consider the visual range changes in terms of more than one air mass. 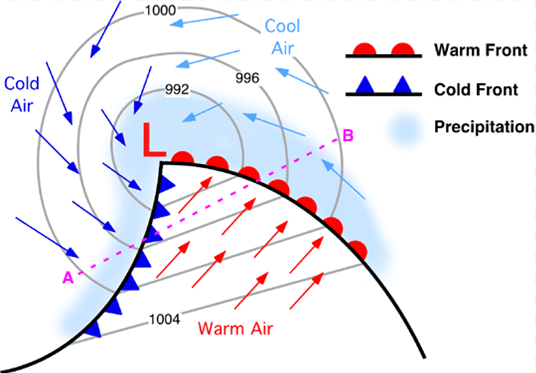 Pressure systems are main weather patterns, which causes the air mass dynamics. We have a high and low pressure area. High pressure areas form due to downward motion through the troposphere. A weather, typical for a high pressure systems has been described above. Usually a high pressure system brings a stable weather with one air mass laying on some area. Let’s talk more about a low pressure areas, which very often causes an air masses movement. Low pressure area forms as an result of convective motions, which leads to pressure drop and convergent winds, blowing from outside to inside. Another way to form a low pressure area is the temperature gradient between two different air masses. It results creating a two noticeable borders beteen these 2 (or sometimes more) air masses. These borders are a cold front and warm front (Pic. 43). Pic. 43 A typical view of the low pressure area (Themarineobserver.com). With the low pressure is related one very important thing: when the frontal band passes, the air mass obviously changes. Important is the assumption, that the air coming behind the atmospherical front is always clearer than the “older” air being before frontal band. Better is when front brings precipitation, because the aerosols can be removed from the air easily. Is not a rule, that the air can be more advantageous when front is much colder. Usually much colder fronts bring the air with big humidity. In this case the cloud base level is also low and appreciably reduces the visibility. After passing the cold front we get a lowered cloud, which further existence depends on the wind. Slower vanishing of clouds above mountains can make our observation disintegrated. However not always must be like this. There is many cases, when after cold frontal band the visibility is appreciably better, except some isolated clouds with passing rainfalls, deteriorating an atmospherical horizontal transparency in places. It happens usually in three cases: when cold frond passes above much warmer surface, when frontal rainfall is strong and when after cold frontal band wind is strong. A first case refers to the situation, which has been mentioned in previous section: much warmer surface causes heating of the air mass, which gets more volume and visibility decreases. On the other hand we can observe quite strong vertical cloud development with passing rainfalls and thundershowers, which are an effect of steaming from this much warmer surface. A best effect is to be observed when this air mass passes above sea or lake, then we experience a lake effect with cloudiness and passing precipitation. In this cases the visibility will be often partially impaired by precipitation. A strong rainfall at the cold front zone, cleares up the atmosphere from haze, making it more transparent ultimately. Atmosphere can be also cleared by strong wind, which blows out any pollutants from the air. Sometimes we experience this situation, when after passing a cold front the wind starts to blow strongly. It can be also the time with a nice visual range. To summarize this thing we can say, that the most fresh air comes always just behind the atmospheric front, what is a basic principle for long-distance observations. The low pressure area brings also a warm section, located between warm and cold front. During the warm section of the low-pressure area we can be able to see far. It happens, because warm air has a less moisture. This situation occurs in colder part of the year. The warm section should be geographically wide enough however the problem is that colder front, coming behind the warm one is quicker. The visibility area should be far enough from the ciclone center, where cloudiness and precipitation occurs. Better is when wind in warm section is stronger otherwise the weather tends to be misty. The air should not be too warm due to steaming. A stable weather for longer time at some area causes, that exsiting air mass transfers and “getting older” deteriorating the visibility. It also refers to the air masses, that comes already transformed to the observed areas like arctic air mass crossing a wide steppe areas before approach to central and southern Europe. Usually the atmosphere is the most transparent at 1st and sometimes at 2nd day after a fresh air mass approaching (Pic. 44). Pic. 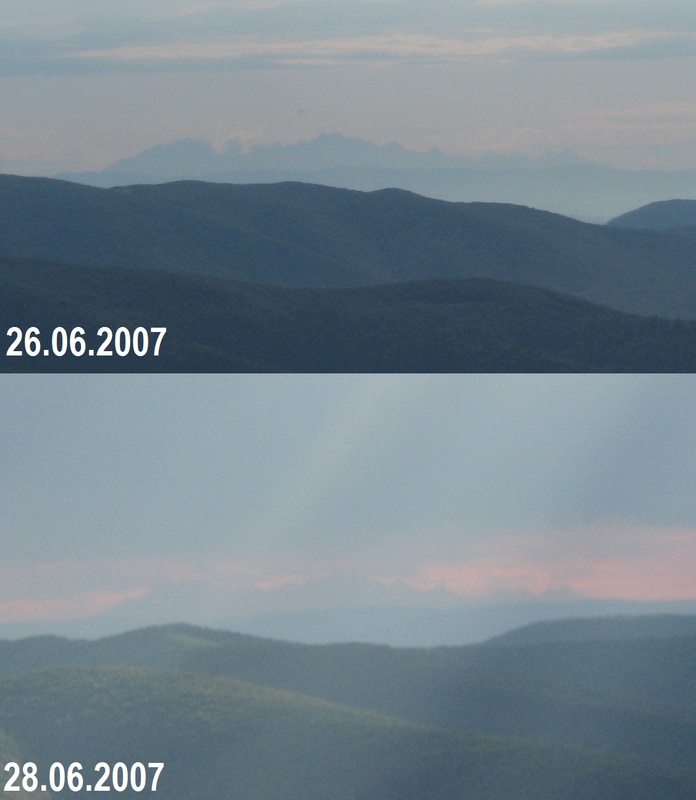 44 View towards Tatra Mts from Bieszczady Mts (Poland) at about 170km distance on two separate days, where 26.06.2007 was a 1st day with Polar maritime air mass and 28.06.2007 was a 3rd day with the same air mass. The air 2 days later was less transparent. Despite no big difference with Tatras appearance I should add, that photo below has been taken under cloudy conditions, which prevented from light scattering. In case of cyclones always the front, from where air mass is coming is clearer than back. Visibility is also better when closer to the anticiclone center. Favourable conditions provide also the pressure increase with wind, when air is mixing. Sometimes it can have a negative side when wind rise a aerosols from naked ground. The antycyclone presence favour the planetary boundary layer development, where haze is enslaved and visibility reduced. The thermal inversion (typical for colder part of the year) brings very favourable horizontal visibility conditions, although it may not work for extremal distances. 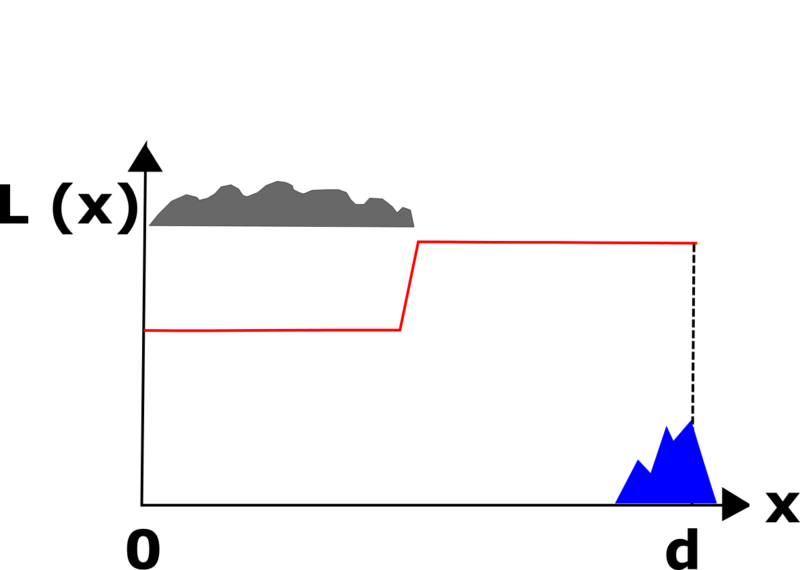 Main role plays the altitude of the inversion boundary (inversion layer thickness), which depends on the pressure level and distance from the anticiclone centre. Saying again, it can reach even up to 2000m above ground. Another role plays an age of inversion. Older inversions behaves on different way, the boundary can be more fuzzy. Taking into account the dynamic weather features is very important to check the weather both for the observation place and the object observed, especially on longer distances, which will be explained in the next part of this article. The weather conditions for observed object are beyond the horizon. For instance medium-level and high-level clouds can complicate the observation conditions significantly, especially during the light level drop around dawn and dusk (Pic. 40, 41). Sometimes the different weather conditions occur in close distance from the observer. Then watching in oppisite direction we can have a two different visibility patterns (Pic. 45). Pic. 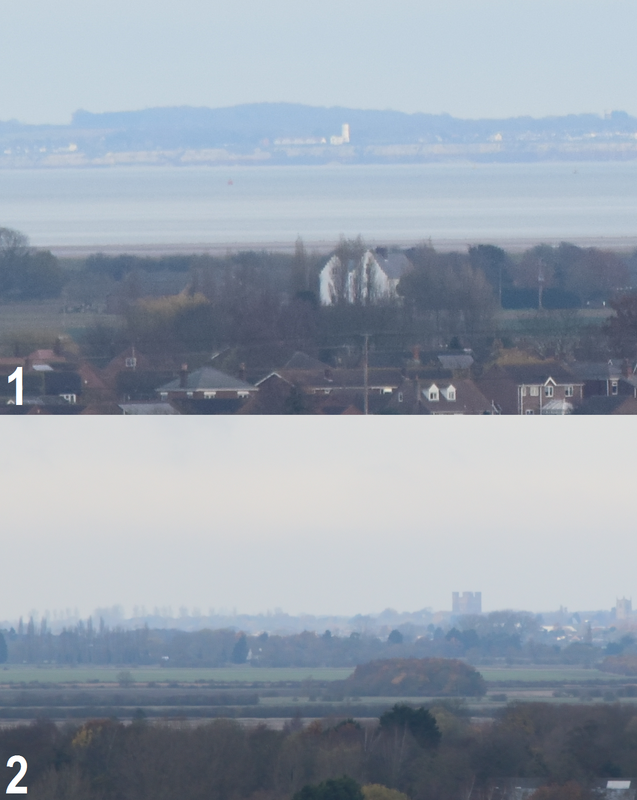 45 View from the St. Botolph’s Church tower at Boston (UK): 1 – Towards Hunstanton Old Lighthouse (35km), 2 – towards Tattershall Castle (17km) and unfortunately invisible Lincoln Cathedral (45km). The weather changes occured just behind the Tattershall Castle, making everything beyond invisible due to much higher humidity and stratocumulus cloudiness, unlike to opposite, eastern side of the view, where atmosphere was much more clear. Is nice, when sufficiently big and stable high pressure area is located towards the object observed. Is good to observe the local weather conditions both for surface and certain altitude due to difference with humidity and cloud level, which I will develope in the next part of this article. 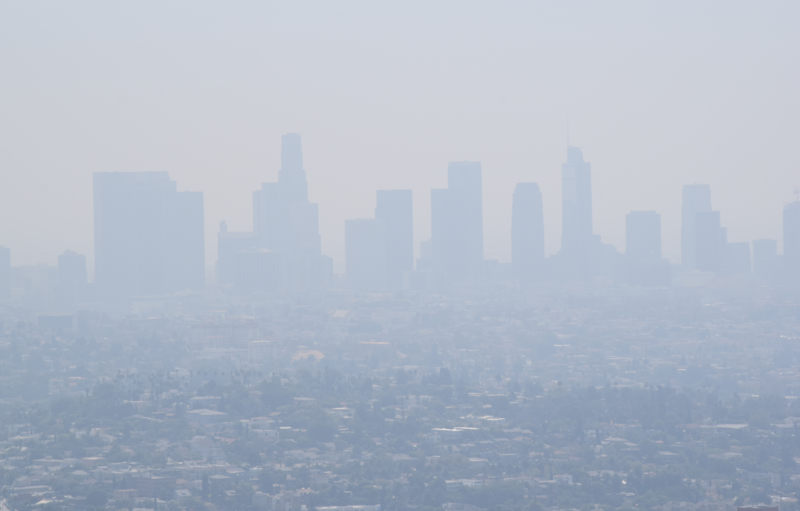 In general, the appearance of visibility of haze is determined by the concentration and distribution of light scattering and absorbing particles (Malm, 2016). We have 2 basic types of haze (Pic. 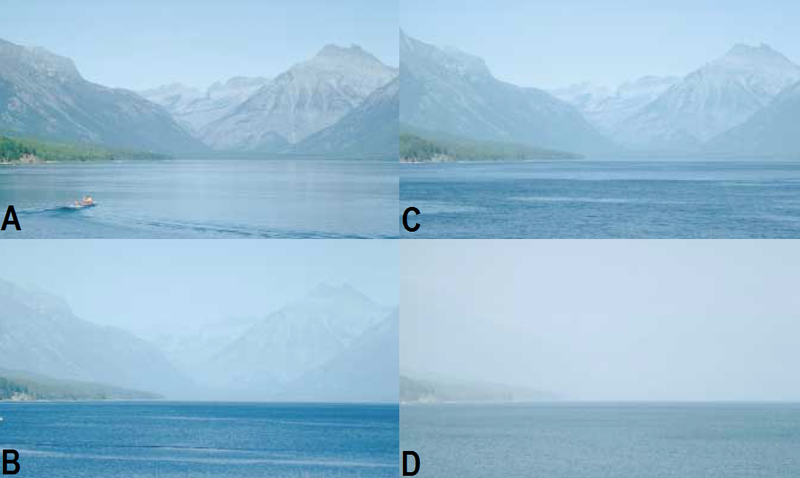 46), whereas the uniform haze is much worse, because generally obscures all landscape features in the scene and may be harder to differentiate from naturally occurring background haze (Malm, 2016). Next to these 2 basic types of haze we can point also a plume, which has a layered character and arises out of pollution emission from i.e. chimneys or wildfires, which impair visibility partially on elevated level (Pic. 47). Pic. 46 Types of haze according to Malm, 2016. Pic. 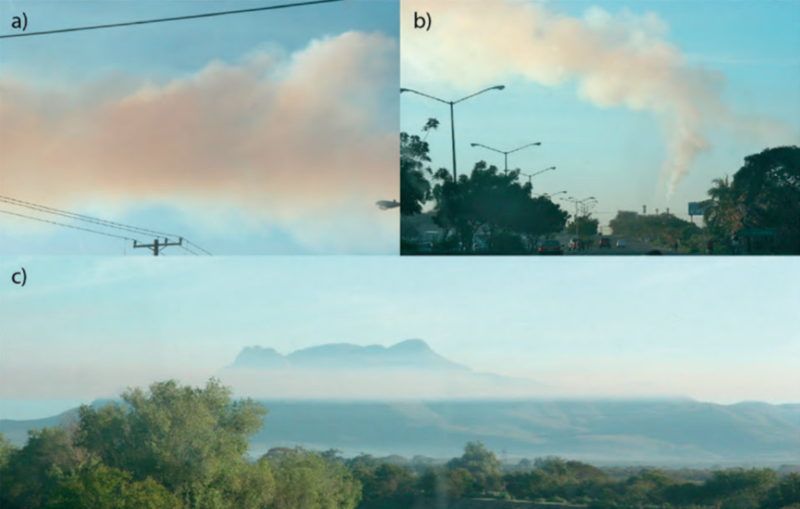 47 A plume from an uncontrolled coal-fired power plant near Mazatlan (Mexico), viewed: a) a few kilometers downwind from the plant, c) tens of kilometers away from the plant, where b) plume doesn’t tend to mixing with a stable atmosphere (Malm, 2016). A different pollutants absorbs a different wavelengths of light. Due to their thickness and local atmosphere stability we can observe their impact on the vista. For example a black carbon absorbs all wavelengths of light making its plume dark appearance. Another pollutant, a nitrogen dioxide gas absorbs more in the blue, tha in the red spectrum (Malm, 2016). When nitrogen dioxide combines with varied background illumination, it yelds a very brown atmospheric discoloration (Pic. 49). If a volume of atmosphere contains a lot of nitrogen dioxide is shaded and if light passes through this shaded portion of the atmosphere, the light reaching the eye will be deficient with photons in the blue part of the spectrum (Malm, 2016). As a consequence the light will appear brown or reddish in colour. However, if the light is allowed to shine on, but not through, that the same portion of the atmosphere, scattered light reaches the observer;s eye and the light appear to be gray in nature (Malm, 2016)(Pic. 48, 49, 50). Pic. 48 A blue photo depletion in the nitrogen dioxide, being present in the atmosphere (Malm, 2016). Pic. 49 Brown discoloration resulting from an atmosphere containing nitrogen dioxide, being shaded by clouds viewed against the blue sky. Light scattered by particular matter in that atmosphere can dominate light absorbed by carbon dioxide, causing a grey or blue-appearing haze (Malm, 2016). Pic. 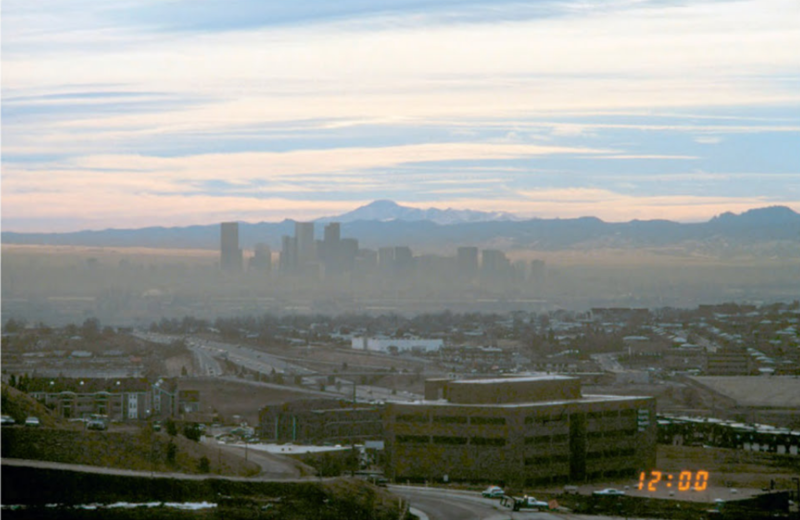 50 Inversion layer over Denver, Colorado, that trapped carbon dioxide emissions. Because carbon dioxide gas absorbs more in the blue portion of the spectrum, the result is a brown haze layer (Malm, 2016). Depending on the weather conditions (turbulent or stagnant atmosphere) we can point the three ways, that air pollution can visually degrade a scenic vista (Pic. 50). Pic. 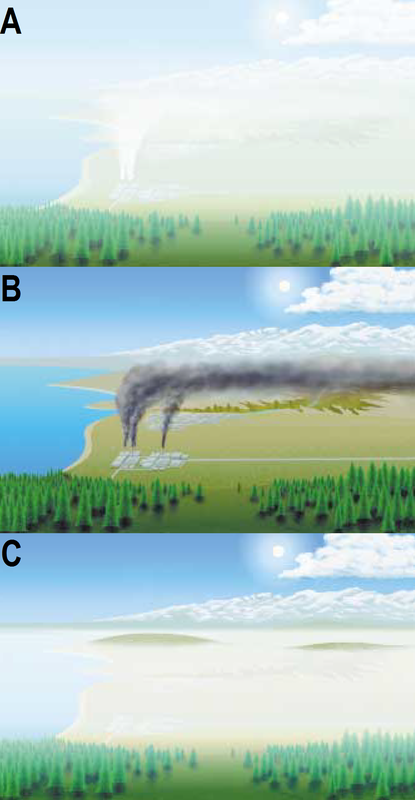 51 The three ways, that air pollution can degrade a scenic vista, where: A – pollutants mixed with the atmosphere under turbulent conditions, creating a layered haze; B – haze appearance as a coherent plume under stagnant atmosphere conditions during the winter; C – layered haze appearance under stagnant atmosphere conditions during the winter (Malm, 2016). In layered haze typical is the contrast edge distinguishing a clear background above from impaired landscape below. 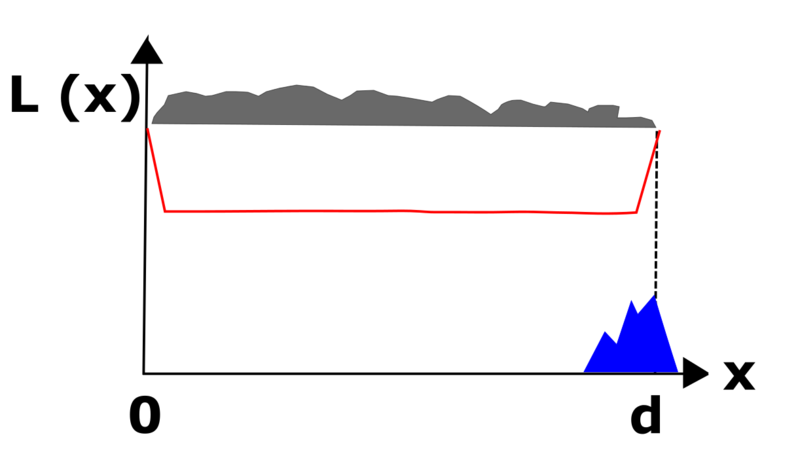 This situation is typical for temperature inversion, when haze with (often) air pollutants is trapped near the ground. 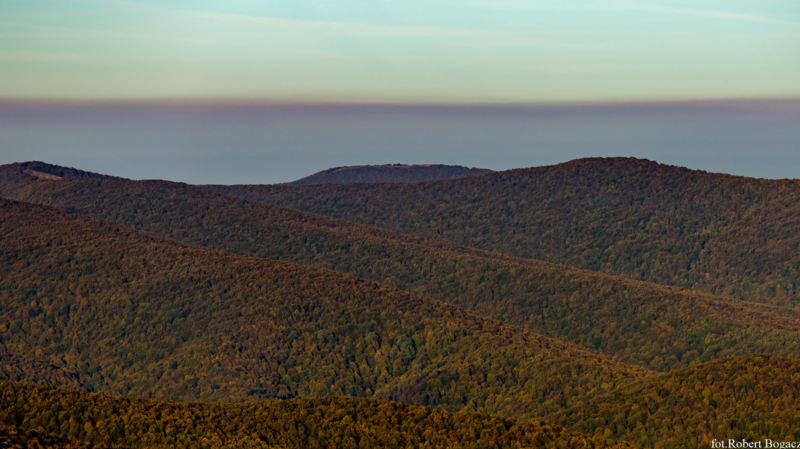 The layered haze can be misleading for observers being onside of layer, where horizon is partially or even totally obscured, unless this layered haze is thin enough to show a pristine view above (Pic. 52). Pic. 52 Tatra Mts seen from Jastrzebie Zdrój (Poland) at about 130 km distance. 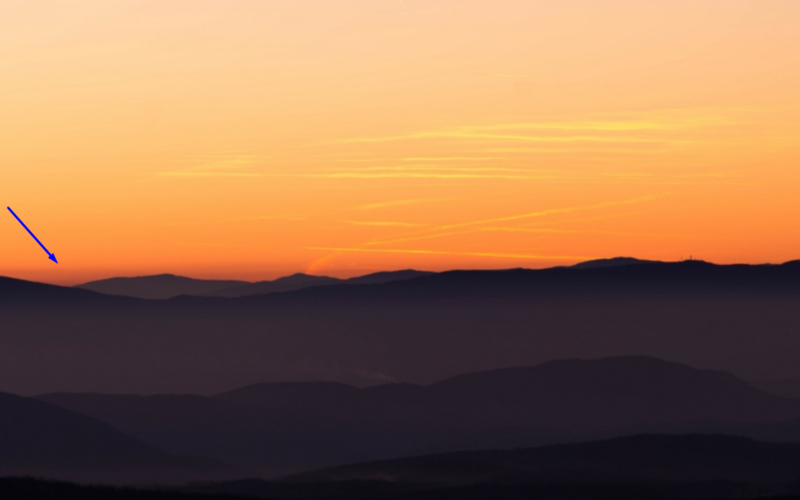 In general a vista is fuzzy, what is an effect of location the observation place inside a layered haze (inversion layer), whereas just above the atmosphere is transparent with an excellent visual range (credits: Grzegorz Luranc). In the meantime above around few hundred meters view can be completely different with background haze only (near Rayleigh scattering conditions). In this event for people being on the bottom of the basin haze will have a uniform character whereas four mountaineer being above it will appear as a layer. A naturally due to the various air masses we have a various level of uniform haze (Pic. 53). Pic. 53 A view on the Garden Wall from Lake McDonald (Glacier National Park, USA) vista, presenting a different level of uniform haze (Malm, 2016). A uniform haze shouldn’t be confused with a regional haze. The regional haze refers to more to a large spatial scale of visible pollution. The regional haze understanding depends on the geometry and the observer. Above I wrote about the situation, when observer is located underneath the haze layer and he is not aware of perfect visibility, above this layer of haze. Here I would like to point, that observer, being inside the layered haze can judge the haze to be uniform in that he would not observe a haze with a defined edge (Malm, 2016). 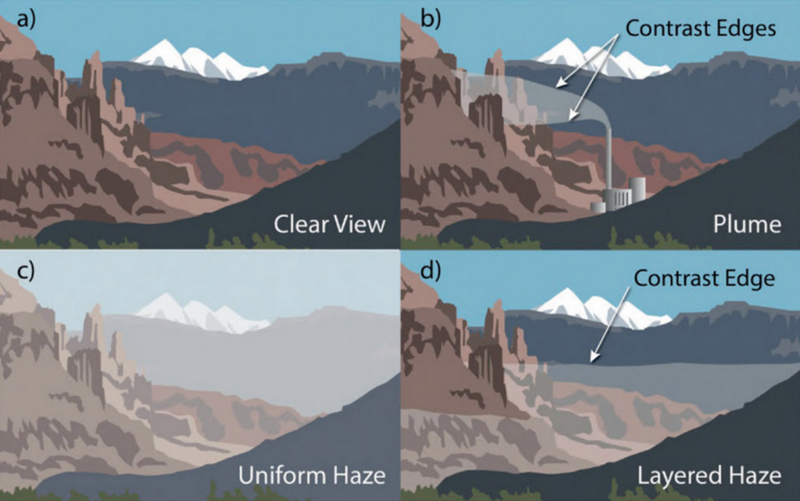 When observer is located above the layered haze, when hiking in mountainuous regions, then he is able to see a regional haze in extend, which appears to be layered in vertical profile. Pic. 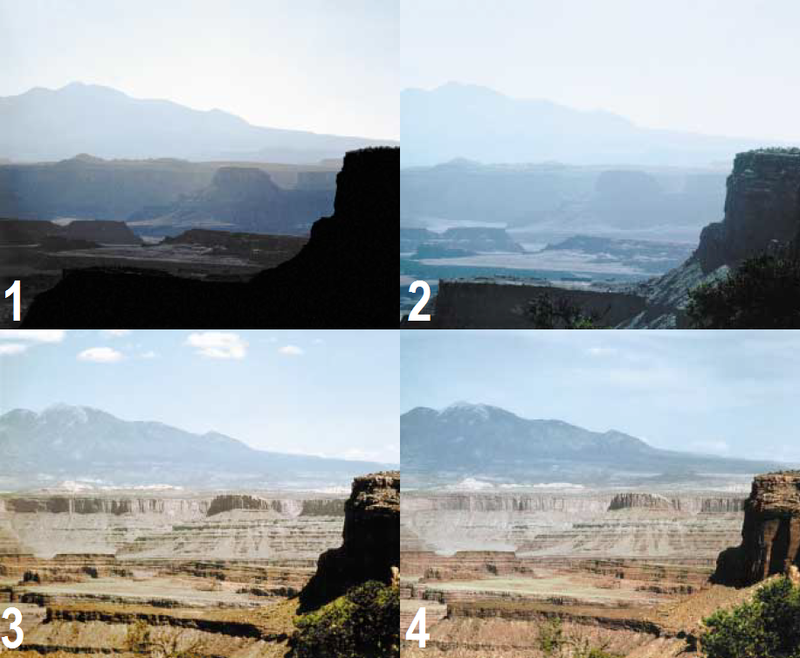 54 View on the La Sal Mountains from Canyonlands National Park with effect of regional and uniform haze, where: a – transparent view, b – unoform haze with decreasing density towards the mountain summits, c – layered haze, d – uniform haze with cloud deck hiding the mountain tops (Malm, 2016). Haze tend to be worse when closer to the ground due to bigger humidity and poor ventilation properties (Pic. 35, 36), which has been raised in previous section. Also urban areas with surroundings appears to be more hazy due to a lot of emissions. Urban haze is specific, because due to high pollutants concentration (higher than in non-urban areas) usually impair the visibility much more. Sometimes even buildings only a few kilometres distant are substantially obscured (Pic. 55, 56). Pic. 55 A Los Angeles skyline as seen from Griffith Observatory at only about 10 km distance. That day was a big pollutant concentration. Pic. 56 Sometimes a haze layer is very thick, giving a misty appearance for objects at only a few hundreds meter distance (Malm, 2016). Not to mention, when haze is sufficiently dense to obscure features that are only a few meters distant. In termal inversion conditions, when layered haze is observed in urban areas the highest skyscrapers can extend up through the inversion layer giving very good visibility conditions (Pic. 57). Another haze information has been described in my previous article. Pic. 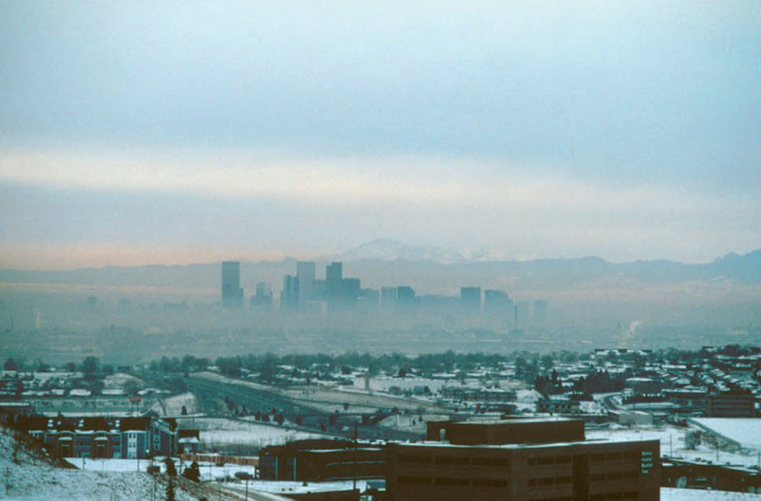 57 A deep inversion with trapped pollutants, causing a shallow haze layer in Denver, Colorado. The depth of the haze is only a tens meters, with buildings extending well above the layer (Malm, 2016). 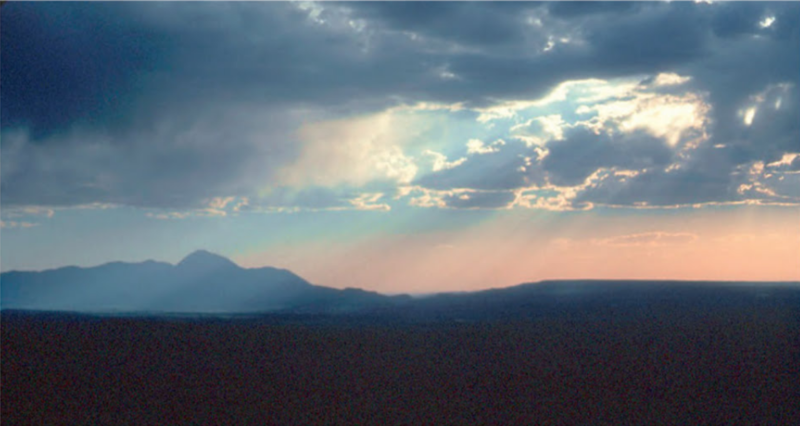 There are three major factors determining a visual range by light scattering: an astronomical, haze and cloud coverage. In astronomical point of view important is solar position on the sky, which has been described in second chapter. However there are still a few issues, which I must raise up in this section. I was writing about a visibility towards solar and antosilar point. I will remind, that at the antisolar direction the distant objects are better visible in daylight, because the backward scattering doesn’t reduce the visibility as strong as forward scattering (Pic. 58). Besides these objects are usually not shaded by themselves, giving an observer a chance to see some elemts of their relief instead of outline only. Pic. 58 An practical example of light scattering influence on visibility, where: a – a vista towards solar direction, where forward scattering dominates, making haze a whitish appearance. The mountains beyond remain visible, however an observer can see their outlines only; b – an opposite situation, where the same mountain range is seen on the opposite side to the Sun. Then backward scattering gives a bit better chances to spot some objects inside this haze layer. On top of that an eye is able to distinguish some relief details on the mountain range (Malm, 2016). Pic. 59 A forward scattering is the biggest always roughly underneath the Sun. When looking left or right from the middle you spot, that the haze layer has a bit darker appearance, however the forward scattering still plays major role up to 90 deg angular distance from the solar azimuth. The Los Angeles panorama from Griffith Observatory. Situation changes rapidly just after the sunset, when the twilight wedge (belt of Venus) become visible. Then these objects became much less visible due to vanishing the contrast between sky and ground and fast decreasing of background luminance (Pic. 16, 18). As the dusk progress the civil wedge engulf more and more of the sky with the horizon. Finally the angle of visibility in bright atmosphere decrease to more or less 180 deg during the civil twilight to be completely gone at nautical twilight (Pic. 11, 12, 18, 60, 61). Pic. 60, 61 A mountainuous view from Vyhorlat (Slovakia), where 60 – view on Tatra Mts., 61 – View on Slovenske rudohorie. 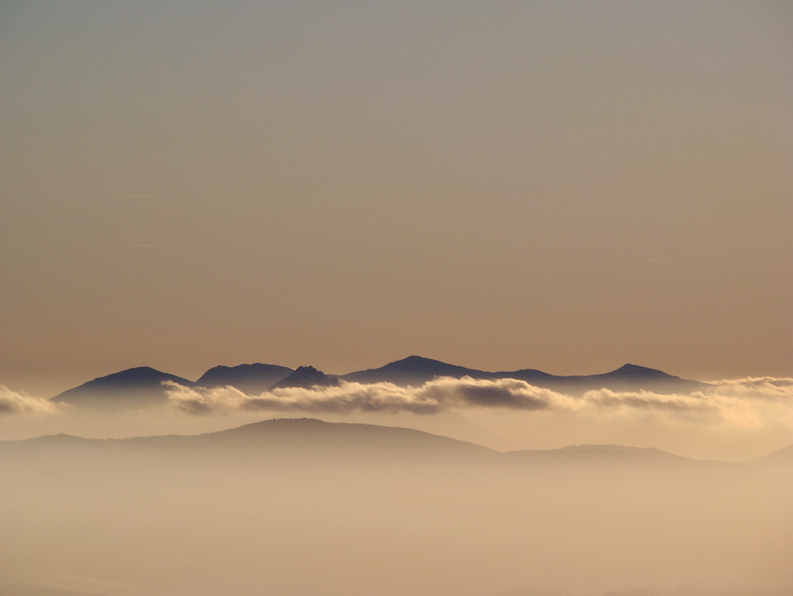 In both cases the inversion layer is visible. The trapped haze (marked by blue arrow) impair the visibility dramatically, because the contrast between hazy sky and remote object is reduced. Haze is not able to scattering the light at this moment, however it extinct the light diffused in he atmosphere (Naobzore.net). Light scattering is important also during the day. 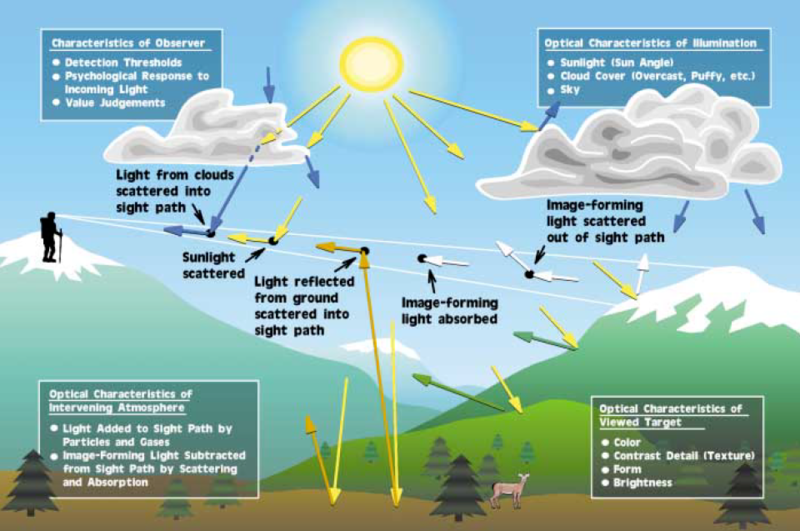 Sunlight, ground-reflected light and light reflected by other objects (like clouds) are scattered by the intervening atmosphere into the sight path. Clouds plays also a different role in visibility conditions. They can extend an visual range throuth the block of the direct sunlight and decrease the light scattering at once. When sky is covered by thick clouds then some parts, or at least one part of line of sight is shaded by them. It incurs a nonuniform solar illumination alongside the path and inhomogeneous irradiation of the atmosphere. The molecules and aerosols being on the line of sight have a different incident solar radiance. The illuminated ones scatter light more efficiently, on the contrary to a shaded aerosols, which have a weaker scattering. Every shaded section present alongside the line of sight appears to reduce the solar light scattering then. It is strongly related to the light transition phenomena, where in shaded regions is less amount of light to scatter. At the same time the distant horizon is being illuminated by strong sunlight, what makes an excellent contrast with shaded regions. This is an event, when stronger light, coming from illuminated part of the sky beats up much weaker light coming from shaded object, making it invisible. It happens only if an distant horizon is unobstructed by thick clouds, because otherwise the view won’t be good. Thick clouds determines a perfect light diffusion, which is next radiated uniformly in all directions (Houghton, 1939). We can list basic five situations, in which the line of sight between an observer and distant object is partially shaded. More details about it show the mechanism and practical proves below. Majority of these situations are contributing to reduce the attenuation of light reflected from an remote object making him more visible for observer. Under clear skies there is no difference between illumination troughout a whole line of sight (Pic. 62). Pic. 62 Normal visibility conditions under clear skies between the observer and distant object, where: x = 0 – observation site, x = d – distant object, L (x) – an level of solar radiation (Vollmer, Schaff, 2018). Sometimes, when sky is covered by a lot of patches of clouds a line of sight between observer and distant mountain can be shaded even a few times (Pic. 63). In this ocassion the vista appears to look slightly better, tha under clear skies, however is still not clear enough due to strong light scattering in places. Pic. 63 Some places get a less amount of solar radiation, when shaded by patchy clouds. It can improve a visibility a bit, especially at solar direction. When sky at the observation point is cloudy and the sun is shining at the distant object far away (Pic. 64), then the visibility conditions are slightly better, but not perfect. They depends roughly of the part of line of sight, which is being shaded. Usually a far, illuminated mountains can merge with illuminated sky, when a haze concentration level is high. Pic. 64 A situation, when sky above observer is cloudy, but Sun shines on the remote object observed. Depends how long part of the line of sight is shaded a visibility may be better or worst. The best situation for distant object observation is cloud cover located at the path between an observer and object (Pic. 65), which block the sunlight both at observation place and a remote place observed, however the sky just above horizon remains clear and bright. Then the contrast with the sky beyond is the best, giving much better visibility conditions. One drawback is, that observer can see an outline of this distant object only without any details, because they are being shaded. Pic. 65 A situation for the best visibility under overcast sky between the observation site and distant object alongside almost a whole line of sight with clear sky behind the object, far above horizon. The worst situation (Pic. 66) is, when cloudiness appear at the same azimuth with a distant object observed and covers all lower part of the sky down to horizon. Then only a “grey wall” of clouds is to be seen. An object, even in good visibility conditions can be merged with these clouds, especially when shaded by them. If not, it will be capable to reflect some sunlight from its brighter parts (e.g grassland, snow cap, etc). Pic. 66 The worst situation for remote object observed, especially when is located on similar azimuth as Sun position. When najority of the sight path with observer’s site is illuminated, but a remote object is shaded by clouds, then it dissapear behind the light transition phase and haze illuminated by sun. Pic. 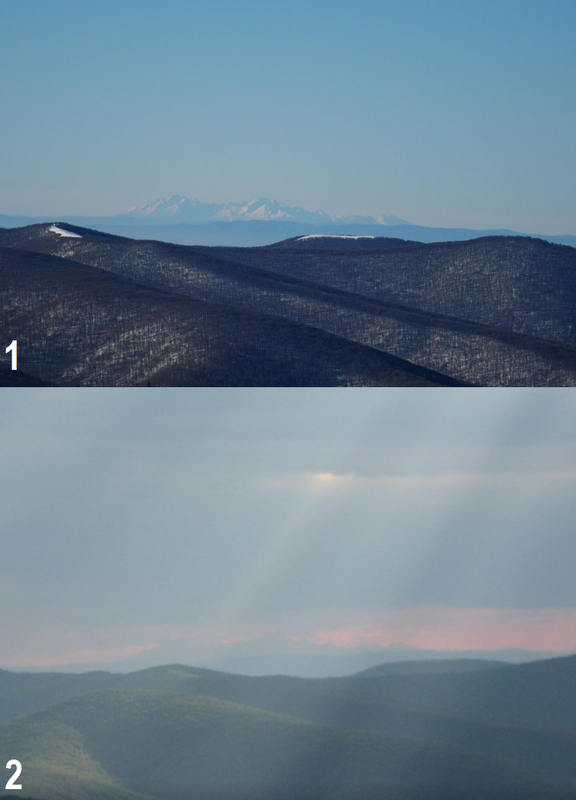 67 A visibility comparison against the cloudiness and light scattering, where: 1 – clear sky, full light scattering on haze particles; 2 – A lot of patches of clouds, which cast shades in places, hence between a multitude of crepuscular rays a visual range appears to be better; 3 – the most unfavourable situation, when a majority of line of sight is illuminated, but remote mountains are shaded by clouds; 4 – the most favourable conditions for extended visual range, where almost a whole path between observer and remote object is shaded, but sky just above horizon remains illuminated directly by Sun; 5 – A situation, when observation site is shaded as well as foreground (blue arrow), but vista beyond is illuminated (red arrow), being better visible in hazy conditions at once. The landscape features include color, texture, form and brightness (Malm, 2016) and also the antropogenic feature. Form is to be the easiest way to recognise the remote object. The best example is between lower and higher mountains. Lower mountains appear like domes, beacons or buttes whereas high mountain can be seen like high sharp and steep objects. Color and texture is also important in case of mountains. When peaks are snow capped usually will be slightly easier to spot them far on the horizon despite of fact, that snow has the biggest albedo. An good example is a picture below, where snow capped mountains, located at about 110km distance are barely visible under a high haze concentration conditions, thanks to snow coverage (Pic. 68). Pic. 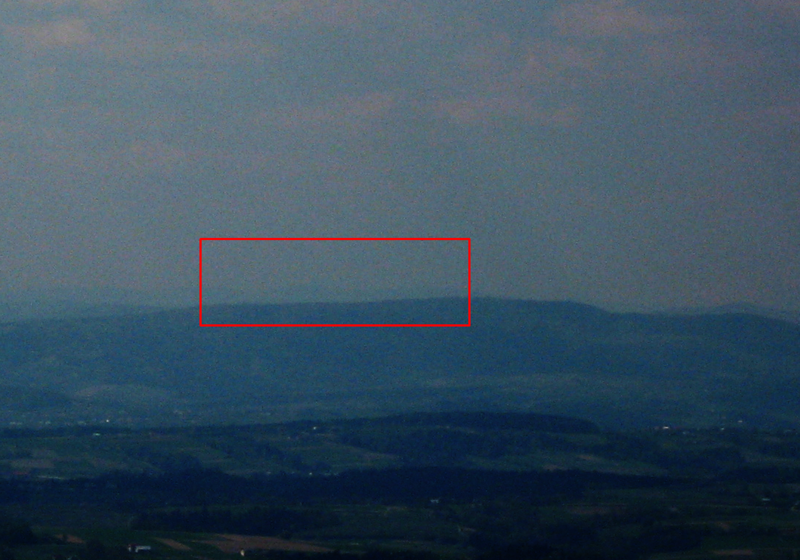 68 Tatra Mts, as seen from Liwocz at about 110 km distance. An observer can barely spot some fuzzy outlines because of snow coverage, which has a high albedo and can reflect a sunlight much more effectively, than another type of surface. Hence the visual range of these mountains appears to be slightly extended under a high haze concentration level. Pic. 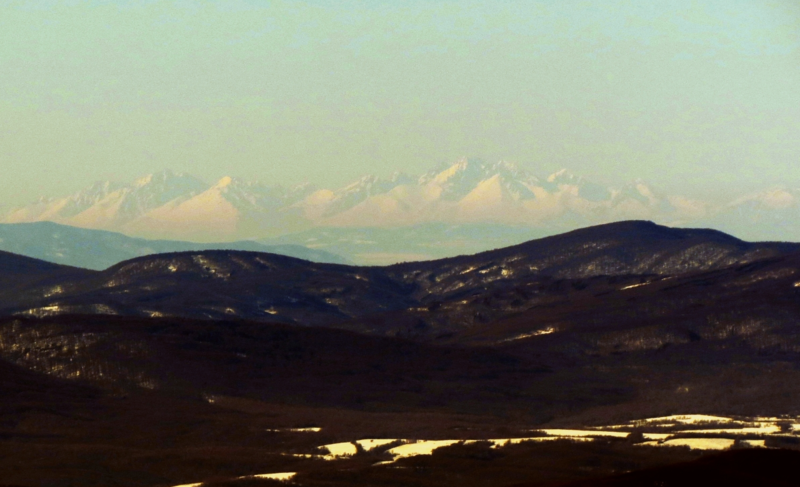 69 Tatra Mts seen from Polonina Runa (Ukraine) at about 200 km distance under transparent atmosphere conditions. Here an observer can easily see, that snow-capped distant mountains are much better visible, as long as they are illuminated by Sun. When shaded, makes a different contrast with the sky beyond (credits: Shukaj Vitalij, Dalekieobserwacje.eu). The best moment to recognise these peaks is in early warm part of the year when these highest part of the mountains are patched with snow. The color pattern of the landscape is strongly associated with its brightness. Brightness enable the object to be more or less visible. When the object surface is brighter then the sunlight is reflected more effectively. The reflected beam from this object is stronger and more capable to reach the distant observer (Pic. 70). Pic. 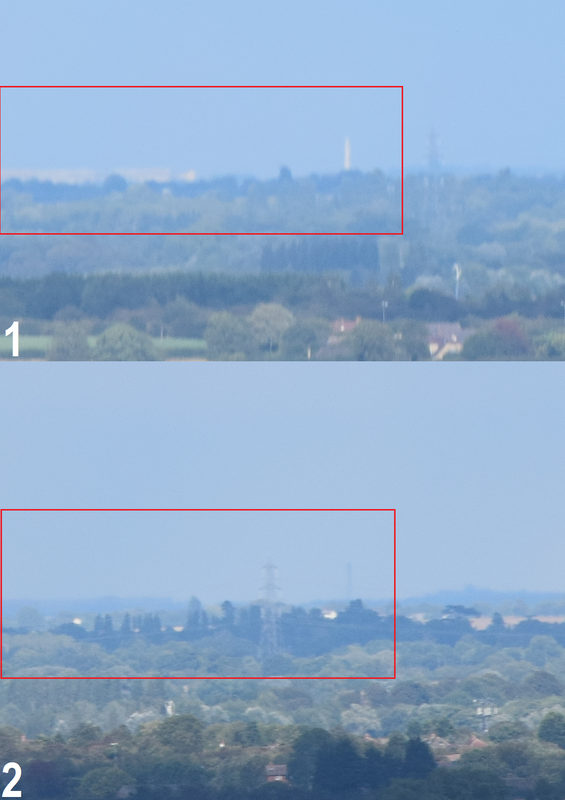 70 CEMEX Barrington Landfill Quarry seen from Sharpenhoe village near Luton (UK) ( 39km distance) in both scenatios: 1 – illuminated, 2 – shaded. An good example of object with a bright surface. In this scenario the object apearance is reliant for direct sunlight. The antropogenic feature states whether the object is emitting light (during the night) or reflecting the light (in favourable solar angle some skyscrapers can perfectly reflect the sunlight for long distances) (Pic. 71). Pic. 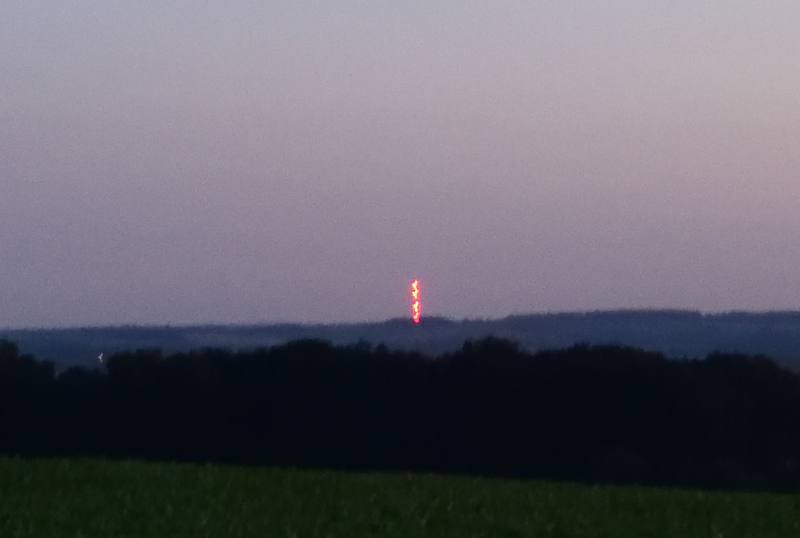 71 Sandy Heath transmiting station as seen from Magog Hills near Cambridsge (UK) at 28 km distance. The TV trasmitter can be easily spotted during the night from long distances because of its own light emission. Another optical issue arising out of the intervening atmosphere. Image-forming information (radiation) originating from landscape features is scattered and absorbed (attenuated) as it passes through the atmosphere toward the observer (Malm, 2016). Pic. 72 A mechanism of light scattering and optical object features impact on visual range (Malm, 2016). C. WHY DISTANT HORIZON APPEARS TO BE BLUE? The blueness of the sky has been shortly described in this article and also on this ocassion. Blueness of the horizon is caused by the smallish part of the air-tiny hydrocarbon particles relased by vegetation, that chemically react with ozone molecules. At the outcome the blue light is scattered selectively and gives the mountains, remote objects blue appearance. You can it always notice even when visibility is perfect and your target is not much distant. Despite of many details of its surface it will have bluish appearance (Pic. 73). Pic. 73 A West Mitten Butte at the Monument Valley (Arizona, USA) seen from: 1 – 1,3 km from south west, 2 – 1,6 km from north-west (towards solar direction), where a thin bluish appearance is to be seen on shaded part of the butte, 3 – from Forrest Gump Point (15 km) with strong bluish appearance. 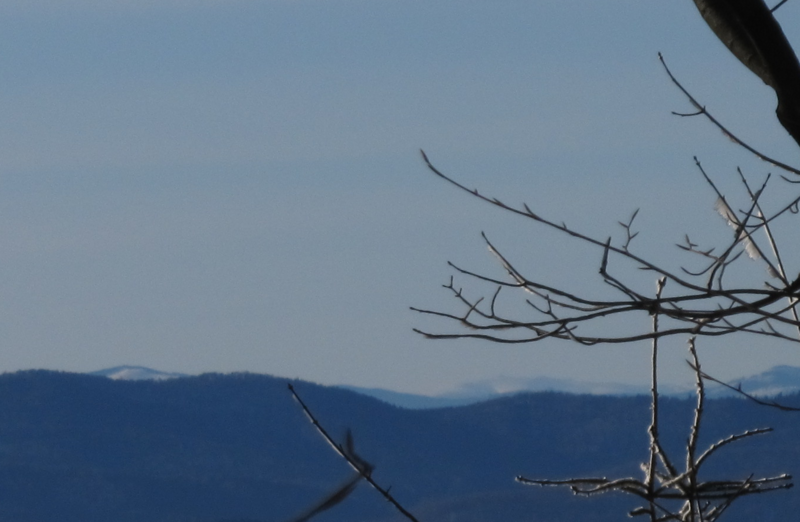 Even if visibility is perfect, the distant objects always appear to look bluish. When visibility is worse the objects appears to be more blue i.e. due to nitrogen dioxide gas concentration. 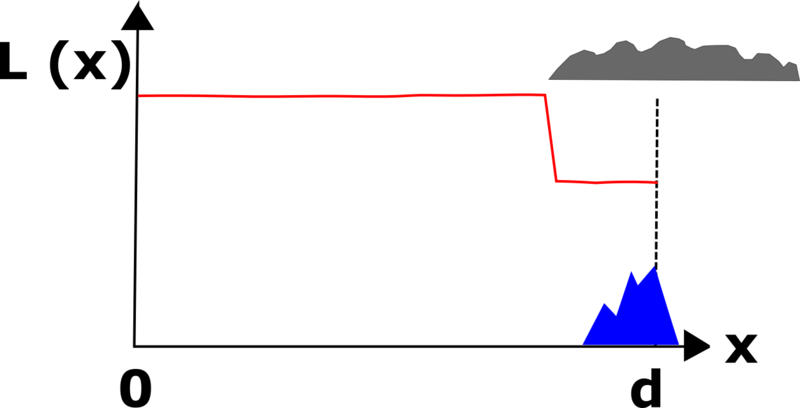 If a volume of the atmosphere containing NO2 is shaded and if light passes through this shaded portion of the atmosphere, the light reaching the eye will be deficient in photons in the blue part of the spectrum (Pic. 47,48,49). As a consequence, the light will appear brown or reddish in color (Malm, 2016), what has been discussed in previous section. Ackerman S.A., Knox J. A., 2007, Meteorology: understanding the atmosphere, Thompson higher education, Belmont, CA. McGraw-Hill Dictionary of scientific & technical terms, 2003, The McGraw-Hill Companies Ltd.
What is a light transition? What examples can we see? Light scattering in the Earth’s atmosphere, part 2 – why is the sky blue and how the sky colour change?